The Great Exhibition of 1851 and the glass that took centre stage. Whenever one looks at a specific type, style, event or period of glassmaking in England, the word influence is often used, and one event, which took place in 1851, had a greater influence on the glassmaking than any other did. Prince Albert's taste and his influence had penetrated far beyond The Royal Household in the late 1840's and he was looking for ways to diversify his interests. And so his dream was to become true in 1851 when the Great Exhibition opened its doors in May of that year. Thackeray described the opening ceremony as a noble awful great love inspiring sight, much grander than a coronation of Albert and Queen Victoria deeply moved by the joy expressed in every face wrote: God Bless my dearest Albert and my dear country, which has shown itself so great today. London was packed to suffocation. Six million people visited the Exhibition, 900,000 Bath Buns were consumed on the premises and over 1,000,000 bottles of lemonade. Very early in the proceedings the Prince had decided to prohibit the sale of alcoholic refreshments in the restaurants, and it was observed that the industrial classes behaved with manifest propriety and good temper. Thomas Cook ran hundreds of excursion trains from the provinces, clergymen brought their parishioners in parties from remote country and school teachers hordes of children in button boots and sailor hats. The effect of the Exhibition was to widen the horizon of the lower and the middle classes and to make London known to thousands of people who had never seen it before. The year 1851 is an important reference point in studying manufacturers of all kinds, no more so than the glassmaking industry. Although known as the Great Exhibition of 1851 the official title was The Great Exhibition of the Works of Industry of All Nations and was sited in London's Hyde Park. Many may think in today's technological age that official catalogues are now very comprehensive and full of facts for the visitor. Well that may be so, but for the Great Exhibition, apart from being extensively documented at the time, the official catalogue ran to four heavy volumes containing over 1,500 pages plus many illustrative plates. Apart from the official catalogue there were many other publications that helped evoke the occasion of the exhibition. Queen Victoria performed the opening ceremony on 1st May 1851. It was not just the glassmaking exhibitors who revelled in the opportunity to show off their wares, but the whole exhibition building was a magnificent tribute to the glassmaker. English glassmakers undoubtedly received their highest recognition by the decision to accept Joseph Paxton's design for the building. Joseph Paxton was the estate manager of the Duke of Devonshire. The truth of the matter was, the design was basically one giant greenhouse constructed of iron and clad in sheet glass. The Birmingham glassmaker, Chance, was commissioned to supply the glass for the construction of the building and it comprised of an estimated 293,655 panes of glass with a total weight of over 400 tons. Before the building was finished it had already been dubbed The Crystal Palace by a writer in the periodical of the period Punch. Imagine the spectacular sight when viewed on either a sunny or rainy day, with so much glass glimmering for all to see. Most of the British exhibitors of glass showed a full variety of glass, both clear and coloured pieces. Many of the pieces were also adorned with fresh flowers to bring out the beauty of the object. Most of the pieces were decorated in some manner or other, cutting vied with painting or even the two combined and gilding was a very much used decorative fashion of the period. Much of the elaborate ornamentation was instigated by the circumstances in which international rivalry was inherently encouraged. The display of English glass at the exhibition was contributed by about 100 makers and agents, and ranged from watch-glasses to a major exhibit of a crystal fountain standing some 27 feet in height. The English glassmaker F. & C. Osler at their Broad Street and Icknield Glassworks in Birmingham produced this magnificent fountain. The company of F. & C. Osler is not very much known outside the United Kingdom, but they were a major force within the glass industry from 1807 producing crystal chandeliers and furniture much sort after by Royalty and Rajahs. For those wishing to learn more about this company may I recommend the following book; Osler's Crystal for Royalty and Rajahs by John P. Smith ~ ISBN 0 9516159 2 0 published 1991 by Mallett Limited. The fountain was certainly an eye-catching piece as well as being a conversation piece and admired by Queen Victoria. The fountain had taken the company just less than eight months, from the time of acceptance letter received by the company from the Office of the decorative Committee, to blow, cut, deliver and assemble for it to be fully working for the opening on May 1st 1851. The crystal fountain was not the only large glass item at the exhibition by F. & C. Osler, for there was a chandelier for 144 candles and a pair of fifteen light candelabra, provoking the premise that bigger is better. The candelabra were 8 feet high and had been a birthday gift to Prince Albert from the Queen in 1849 and may still be seen at Osborne House, on the Isle of Wight, where they stand in their original position. In the catalogue for the exhibition under the glass section it noted that the material; .... is beginning to assume an extraordinary degree of importance in the present day. Yet few manufacturers have, until within a very recent period, made so small an amount of progress. Every process of the manufacturer having been beset with the stringent regulations considered to be necessary to enforce the due observance of the Excise laws, and no exemption being permitted even for the purpose of experiment or improvement, it is scarcely a matter of surprised that the production of glass remained in a poor and imperfect state both as a manufacture and as a philosophical problem. The same causes now no longer existing, a vast amount of progress has been made both in the extensions of the applications of this product, and also in the process of manufacture. These words echo the fact that in the period prior to the exhibition had seen vast improvements in the manufacture of glass. One English company which had shown these improvements through the exhibition was Rice Harris & Son, of the Islington Glass Works in Birmingham, who exhibited samples of ornamental glass of various colours, opal, alabaster, turquoise, amber, canary, topaz, chrysoprase, pink, blue, light and dark ruby, black, brown, purple and green. The article made in these colours were to be found gilded, enamelled, cut and engrave and they consisted of such items as liqueur services, tazzas, compotes, butter coolers, toilet bottles, goblets, water jugs, sugar basins and vases. The same firm also showed thread decorated items, a kind of glass for which Venice is famous and where for many years it was exclusively manufactured. Rice Harris & Son were according to sparse records the only glassmaker to exhibit pressed and moulded tumblers, goblets, wine glasses, sugar basins, salts, honey pots, butter coolers and door knobs. Many other English glassmakers exhibited at the Great Exhibition including the Birmingham firms of Lloyd and Summerfield, George Bacchus & Sons as well as F. & C. Osler and Rice Harris & Son, the Stourbridge area was represented by W. H., B. & J. Richardson, Thomas Webb and Davis, Gateshead & Green, Molineaux, Webb & Company of Manchester and the London firms of Apsley Pellatt & Co., of Southwark and J. G. Green of St James Street Glassworks. Clear glass was only shown by the firms F. & C. Osler and J. G. Green, whilst all the others mentioned included in their displays greater or lesser proportions of coloured wares. George Gatchell the owner of the Irish Waterford glassworks also showed cut clear glass at the exhibition. With the imposition in Ireland of a duty on glass in 1825, the hitherto tax-free production was curtailed and the majority of the once bust makers soon discovered that they were no longer able to compete successfully in the open market place. Waterford had been in operation for sixty-five years when Gatchell took over at the company in 1848. and although it was far from being as prosperous as it had been, it was doing whatever it could to remain solvent during a difficult period. The Great Exhibition of 1851 was a great opportunity to prove how well it was maintaining the quality of glass and craftsmanship for which it had been known for so long. The Great Exhibition had been an ideal place for Waterford to show their wares, which included an elaborate centre, stand for a banqueting table, with forty cut dishes and other pieces. The design was that all the pieces fitted together without the use of any other material or metal other than glass. There was also a wide selection of decanters and another centrepiece on a tripod stand, but by the time the exhibition closed its doors for the last time on 15th October 1851, George Gatchell had been declared bankrupt and the glasshouse was closed down. One of the many agents and dealers of glass exhibiting was the London dealer, Joseph George Green, displaying many items which received high acclaim at the time. In the Art-Journal it reported; 'we scarcely ever remember to have seen glass more exquisitely engraved than in these specimens'. This agent displayed many different variations of jugs being produced during this era and special note was made of the Etruscan shape by their makers and based upon the Classical oenochoe. One item included in the display offered by Green was that of a suspended ormolu chandelier in Elizabethan style fitted with glass silvered by Varnish & Company. Edward Varnish and F. Hale Thompson had taken out a patent in 1849 relating to a process for making vessels with double walls within which the surfaces were silvered. The silvering was sealed so this prevented tarnishing and was letter known as Mercury Glass. Such pieces could be left plain, engraved or cased with one or more colours and then cut through to reveal the mirror like body. Varnish also had their own stand at the exhibition displaying many items of their patent glass in green, ruby and blue most of all of which were said at the time to have been made by the London firm of Powells of Whitefriars. It was reported at the time that; Specimens of the beautiful silvered glass lately become so fashionable, and which have formed so ornamental a feature at various public banquets were exhibited by Messrs. Varnish of Berners Street. The silvered goblets were already familiar to the public, but there were various other articles, such as a chess table and curtain poles, which showed the great adaptability of the material for ornamental purposes. Another writer of the time suggested that the silvering was performed with a mixture of silver and grape sugar [glucose], but he was less than complimentary about the result; The effect, however, is garish, and the articles appear as if made of looking-glass, rather than of silver-plate, which they were intended to represent. Obviously the observations of this reporter were not those of the judging panel which awarded E. Varnish & Company a Prize Medal. Both Lloyd & Summerfield and Oslers showed matt-surfaced glass busts of many famous people, including the Queen and her Consort. There were also what was termed, glass medallion busts of the Duke of Wellington and Sir Robert Peel. One can only assume that these latter busts were presumably moulded cameos or intaglios and hand cut. A writer of the time noted that such objects as glass busts might prove superior to marble for statues and what he termed as monumental erections. Up until now makers of glass had always sought to obtain a shining finish, but now a duller surface was becoming more popular. As with most things, fashions come and go, and it was during the mid-nineteenth century we saw this change take place with matt finished glass becoming very popular. It was very popular as in the case of the opal glass which, was made in both England and Bohemia as well as France. On many pieces gilding was used in place of gilt-metal mounts and many pieces were in two tone. The most popular combinations being white and green and white and blue. Applied decoration in the style of snakes very often adorned such pieces and one of the leading pioneers of this was W. H., B. & J. Richardson of Stourbridge. Opal glass was produced in a wide variety of items of which the most favourite were tall vases neatly adorned by snake like applied decoration and ewers with handles in the same style. Apsley Pellatt and Company exhibited not only finished goods at the exhibition but also a display of different types of glass, models of furnaces, tools and other items which were explained in an illustrated catalogue they produced to accompany the display. The wares shown included some of Pellatt's patented cameos, named Crystallo-ceramics, and known alternatively as Cameo-incrustations or sulphides. Such items had been devised at the turn of the century by a Frenchman, and took the form of small cameos skilfully enclosed within clear glass so that they acquired an attractive silvery appearance. It was felt at the time that special attention should be drawn to the vital importance of balancing the properties of the glass and the porcelain composition of which the cameos were made or failure would certainly result. It should be noted that the figure intended for encrustation must be made of materials that will require a higher degree of heat for their fusion than the glass within which it is to be incrusted, these are china-clay and super-silicate of potash, ground and mixed in such proportions as upon experiment harmonise with the density of the glass. Pellat had begun making such novelties soon after he had been granted a patent in 1819, and some two years later he published a book describing and illustrating examples of the cameos embellishing all kinds of subject matters ranging from prominent people such as Napoleon Bonaparte and William Shakespeare and other items such as the Badge of the Order of the Garter. A further adaptation of the process was for the preservation of inscriptions, which were enamelled on a suitable material and then enclosed within a protective coating of clear glass. Such examples were used in 1840 to record building operations that took place at the Tower of London, Windsor Castle and many other important structures. Most of such pieces are inscribed with the words Apsley Pellatt, Incrustator. Pellatt used the process between the early 1820's until around 1860. The method was complex and unsuitable for large scale production, but with so many surviving examples to be found there must have been a steady demand. Other companies also made cameos, notably John Ford Glassworks at Edinburgh. It was predictable that a Scottish company should look towards a Scottish hero and hence they made cameos of the head of Robert Burns as well as the Duke of Wellington. Pellatt's exhibits at the Great Exhibition not only comprised of a selection of cameo-incrustations but also what was described as Anglo-Venetian gilt and frosted glass. A series of dishes on tall stems, wine glasses, decanters, carafes, tumblers, claret jugs and other tableware items were elaborately cut in a fashionable manner resembling the work of the Venetian glassmakers. The frosted items certainly owed their origin to Murano, but are best known as ice-glass these days. This surface to the glass certainly resembles crushed ice and it was the revival of a technique practised in the sixteenth century. Apsley Pellatt always showed a keen interest in glass making and this is evident in many of the techniques he used and the revival of different types of glass. Pellatt will also be remembered for his book, Curiosities of Glassmaking first published in 1849, in which he described some of the methods employed by the early craftsmen at Murano. In 1840 Christies the London auction house sold a collection of glass belonging to Lady Mary Bagot, among which were some Venetian glass pieces. In the catalogue listed, as frostwork was a latticinio salver, tall glass and goblet which realised GBP27, GBP19 and GBP15 respectively. These prices in today's currency seem very low but in their day they were considerably higher than was expected the items would make. This is possibly one of the first auctions to have taken place in London that included Venetian glassware. Some seven years later in 1847 a Frenchman of the name Debruge-Dumenil, a Far Eastern merchant who had amassed a large collection of objects d'art including much glassware, had his collection catalogued by Jules Labarte. Three years later part of the collection was offered for sale by auction in Paris. In total there were 2,000 lots of which 180 lots were of Venetian glass. All the glassware was sold averaging GBP10 per item. The year prior to the Great Exhibition in 1851 saw an exhibition organised by the Society of Arts in London devoted to works of Ancient and Medieval Art. Proud owners of such items were only too willing to have their pieces exhibited, which proved a tremendous success with the public. One display was of Venetian glass, which was widely commented on in the press. By the time of the Great Exhibition, Venetian glass was making a comeback in England after being driven from the English market by George Ravenscroft in the seventeenth century. The movement in favour of such Venetian glass received further encouragement by the formation of the Museum of Ornamental Art, which was the forerunner to the Victoria and Albert Museum in London and was at that time part of Marlborough House in St James. The success of the Great Exhibition was instrumental in a committee being appointed and given a Parliamentary grant of GBP5000, with which to purchase suitable objects for formation of a museum of manufacturers of a high order of excellence of design or rare skill in workmanship. A large collection of works of art owned by Ralph Bernal was sold at auction in 183 and this was a starting ground for the museum. In a catalogue issued three years later for the new museum, there were seventy-four pieces of glass listed. Out of this total number of pieces sixty-one were listed as Venetian of which thirty-five had come from the Bernal auction. The highest price paid for a piece of glass at the auction of GBP54, was for a large flat tazza on a stem enamelled with foliage and arabesques and partially gilded, paid by Baron Gustave de Rothschild. The Venetian style of glass pieces was back in the fold and popularity of the English. This was evident in some of the many pieces displayed by Bacchus and Sons, one of which was champagne glasses with colour twist stems. The stems were twisted into one or more loops midway and they were illustrated in the catalogue as Venetian. Although the English craftsmen tried their best to imitate Venetian glass they were handicapped somewhat by the peculiar properties of English flint glass. Venetian glass was made from a metal incorporating soda as the principal flux, which gave it the quality of cooling more slowly in comparison with the English glass. This allowed the Venetians more time during which to manipulate the material and form it into complex shapes without frequent reheating, whereas the contrasting quick cooling flint glass did not respond easily to the same treatment. Venice is also credited with being the place where one of the revivals of ancient Roman glassmaking techniques originated, one which played a small and barely noticed role at Hyde Park in 1851. Amongst the foreign exhibitors was Pietro Bigaglia who had exhibited a selection of millefiori glass paperweights in Vienna six years before. Apsley Pellatt in his 1849 book Curiosities of Glassmaking illustrated on in colour giving it the caption Venetian Ball. For those that have a copy of this book, may I refer you to Plate 6 - Fig. 1 and the notes listed for this item are as follows; A solid ancient Venetian Ball, consisting of fragments of filigree cane, placed in a hollow, transparent, white glass pocket, and collapsed by extracting the air as the mass fuses together by the heat of the furnace. One should also point out at this time the French glassmakers were also producing this style of paperweight which was to proved very popular. The organisers of the Great Exhibition divided and subdivided the many thousands of items into convenient categories of which Glass was Class XXIV, of which subsection 5 of section F comprised of Glass Mosaic, Millefiori, Aventurine and Venetian Glass Paperweights. So despite the fact that French made paperweights had been produced for some five years the name of Venice still clung to them. There are two factors that made Venetian wares more popular. One was the fact the Venetian glass had a superior sales feature and the other was possibly because of the wariness of France, alerted by the recent and continuing political troubles in that country, hence making the English somewhat reluctant to knowingly buy French goods. The principal French Glassmakers of the time were only represented at the exhibition by Clichy who displayed some paperweights, the others such as St Louis and Baccarat were conspicuous by their absence. Although evidence proves that both the English firms of Bacchus and Rice Harris & Son were both producing paperweights around this period of time but there is no record of either displaying them at the Great Exhibition of 1851. Most being produced were of millefiori pattern and by this time most were using a lettered cane to denote the manufacturer such as IGW, which has been suggested it stands for Islington Glass Works. During the period of the exhibition and the early 1850s, not all glassware sold was ornate and costly, and both makers and dealers were keen to sell their better and more expensive goods, so commonplace varieties seldom received attention. In addition to their production of such items as paperweights, Rice Harris & Son displayed, pressed and moulded glass tumblers, wine glasses, sugar basins, door knobs, salts, goblets and both honey pots and butter coolers at the exhibition as already stated. Henry Mayhew in his book; London Labour and the London Poor made comments on the availability of cheap glassware. He noted that street sellers of second-hand glass were seldom seen in the capital. Mayhew who himself was an ex-seller of glassware said it had been a profitable trade making around one pound a week. At the period before cast glass was so common, and, indeed, subsequently, until glass became cheap, it was not unusual to see at the second-hand market stalls, rich cut glass vessels which had been broken and repaired, for sale at a low price. The dealer often being the repairer and hence making a profit from damaged goods. One item, which began a lengthy enjoyment of popularity around the time of the Great Exhibition and featured greatly in many Victorian homes, was the glass lustre. A lustre can best be described as a cross between a vase and candlestick but without any real function except to be ornamental. The lustre varied in design over the years, its decoration ranging from cutting to casing with painting and gilding or, in its cheaper versions, to harshly tinted opal or coloured glass. No matter what the quality of a lustre, it was mandatory that it should bear a fringe of cut prisms and drops suspended from the rim. All lustres were made and sold in pairs and from the vast amount that have in recent years come on to the second-hand market, one can assume that not many British homes did not have their fair share of them. When one thinks of glass, it is not immediately thought of in the realms of the clothing industry. However buttons made of glass, moulded with holes ready for stitching, or with a single larger hole through which a metal shank could be riveted in place were being made in vast quantities. Evidence suggests the buttons were formed by what was termed as pinching, using a pliers like tool for the purpose. This tool had the shape and ornament of the button cut into its jaws in intaglio, so that a small piece of molten glass could be squeezed between them to be easily and quickly completed. Another kind was somewhat more complex in its making, requiring a sheet of clear or coloured glass to be coated with lead foil and then cut into pieces of the required shape and size. These were heated to melt the lead, and prepared pieces of tinned metal, already complete with shanks, were soldered to the lead back glass. Each button was then finished by being cut to its final shape and given a decorative cut pattern on the front. Possibly the leading company making glass buttons during this era was Neal & Tonks of Birmingham. It is also known that the same firm also made glass shirt studs as well as horse bridle rosettes in fancy cut glass. Albert Hartshorne wrote in his detailed and comprehensive history of "Old English Glasses" that there was simply no proof that there was glass production in Britain from the 6th to 15th century. His authoritative assertion on such matters may be questionable, for he stated that a glassmaker by the name of Laurence Vitreanus was melting glass at Chiddingford in the year 1230. Also in an account of the inventory issued by the second son born to King Edwards I [1268-1274] it made reference to a beaker which is said to have cost two and half pence. This also adds fuel to the argument about whether glass was being produced in Britain, as the low cost is more than likely because it was produced here and not overseas. There is further proof that Abbot of Wearmouth sent to France for glassmakers in 675 and in 1350 large sheets of colourless glass could be made in England which were used to glaze the windows of St. Stephens Chapel at Westminster. Saxon tombs also revealed glass objects which also supports the claim that glass had been made in England prior to the Roman conquest and survived through that period. If further proof was needed to shame the information given by Hartshorne, one only has to check the tax roll for the East Anglian town of Colchester. The register lists three glass-masters although the records do not show if they were glassmakers or just plain glaziers. Records also show that later in the sixteenth century, the predominant form of glass in England was of the French and Venetian form. During 1570 evidence supports the fact that French glassmakers and mirror makers who first settled in Surrey and a little later in Salisbury, Wiltshire and this marked the beginning of the modern era in glassmaking in England. Many had come to England through the mediation of their fellow compatriot, Jean Carre, who had settled in Antwerp, Belgium. Wood was a major necessity in glassmaking for the forests provided the fuel to heat the furnaces and hence many of the earlier glassmakers often went from one place to another in search of forest areas. Their wanderings took them from England to Scotland and Ireland, in search of this fuel and evidence can be found through shards of broken glass at many sites throughout all the countries involved in these early days of glassmaking. Conservation was even evident in those early days and the necessity of preserving the already scarce trees for the more important construction industry lead to a ban on the use of them as a fuel in 1650. Hence the change was made to using the fossil fuel of coal for the furnaces used in the making of glass. Coal gas escaping from the burning of this fuel created a problem and hence the process of melting was made using closed pots to protect the glass batch. During this thirty-year period, Vice Admiral Mansel held the glassmaking monopoly in Britain and he was followed by the Duke of Buckingham, who, thanks to his influential position at Court, fought against the import of incomparably better glassware from abroad. By the end of the seventeenth century Great Britain supported some eighty-eight glasshouses and the following century saw glass production making tremendous strides forward both in quantity and quality. The glassmakers of this period saw the potential of the market place producing mainly goblets and dishes which were in far greater demand than other items. * Inns and taverns were flourishing within Britain far long before any other country. These provided a natural outlet for the glassmaker. * The wealth of the economically rapidly developing middle classes was also increasing in a very quick time. * The rising ability of the founders using their purchase power of primitive capitalism led to certain customs developing in Britain and not elsewhere. * One such tradition being the use of different glasses for each type of wine. This was mainly influenced by the entrepreneur of the day mixing the imported wines with different kinds of distillates of local origin. One could possibly say from these earliest of days the Anglo-Saxon set the cocktail trend and for each new concoction a new style of vessel was created. From this lively society of life, it stimulated production of other items on a large scale, such as candlesticks and chandeliers. Another important factor one should also take into consideration when looking at this period in the glassmaking industry of Britain is the growing colonial Empire which, opened up large overseas markets, especially in the North American continent. From those early days of trade, sales were secured through tariffs and other means, which such countries as England could enforce on dependent countries. It was emerging that the two most popular types of glass being produced for overseas sales were that of Bristol and Nailsea. At the same time the Irish glassmaking industry was striving forward with such glassmaking institutions as Waterford and Cork being the major two. It was during this epoch that the English invention of lead crystal came about. The addition of lead increased not only the weight but also the whiteness of the material, it intended to give the glass an absolute transparency and was known as magnificent lustre. This affect is shown particularly when the facet cut broke the light and reflected it. Evidence supports the fact that during the mid seventeenth century there were six major glass-houses in the London area producing lead crystal glass much admired by many and it intended to have a sheer elegance over that which was being made at the same time in Bohemia. This magical clarity of English glass made it famous throughout the world in the eighteenth century. Most of the polishing and cutting of the glass was done in England by experienced polishers and cutters mainly from Holland but even so their work was not considered as good as that done by those in the Bohemia region. Neither did the shape of the piece display the same elegance nor the variety of pieces being produced in Bohemia. A further additional way of ornamentation was the entire surface of the glass being covered with faceted diamond cuts and this art was perfected by the Bohemian and Silesian glass-houses who developed the art to perfection. It was during this same period that milk glass was introduced into production within England from Bohemia. There was a general need within society for a glass to replace porcelain, which was so expensive. This milk glass was to become a major part of many of the English glass-houses and many pieces were decorated lavishly with oil and enamel colours. Much was changing at this time in the history of glassmaking within Britain and it was not long before English glassmakers along with those from the near continent decided to go to America and apply their artistry. It was in 1607 when the first attempts were made in glass production in the States at Jamestown in Virginia. Since those early days wherever glass-houses have been established we see the art of skilled craftsman has expounded the beauty of glass in many shapes and forms. The Stourbridge Glassmakers of old. Thomas Webb I (1804-1869) founded the Thomas Webb Glassworks - one of the most famous glass factories in the area. He started his career in 1829 in partnership with the Richardsons at Wordsley. His son Thomas Wilkes Webb (1836-1891) took over the firm in 1863. Thomas Wilkes Webb employed some of the best craftsmen that have ever worked in Stourbridge, including George Woodall, Frederick Kny and William Fritsche. He helped make the factory internationally famous and in 1878 he won the Grand Prix at the Paris Exhibition. The Thomas Webb Glassworks continued making high quality glass until its closure in 1990. Thomas Wilkes Webb's sons, Thomas and Herbert Webb (1871-1946) also founded a glass factory in 1897, in partnership with George Corbett. Known originally as Thomas Webb and Corbett Ltd. and later simply Webb Corbett, the factory still exists today, as part of the Royal Doulton group. One of the leading glass firms in Stourbridge in the 19th century was the Richardson factory. William Haden Richardson (1785-1876), Benjamin Richardson I (1802-1888) and Thomas Webb started this in 1829. It was situated on the banks of the Stourbridge Canal in Wordsley, diagonally opposite where the Stuart glass cone can be seen today. The firm won many official prizes and awards, including a Prize Medal at the 1851 Crystal Palace exhibition, which helped to confirm the area as the most important centre of English glassmaking. Benjamin Richardson is sometimes called "the Father of the Stourbridge Glass Trade" because he did so much for the industry. The Richardson factory had several changes of name in the 19th century, but continued to make consistently innovative and fashionable glass throughout. The firm was eventually taken over by the Thomas Webb glassworks in 1930. Other members of the Richardson family were also involved in glass. John T. H. Richardson (1835-1913) established the Royal Castle Flint Glassworks in Tutbury, Staffordshire in 1871. Benjamin Richardson III (b.1864) donated the Richardson Collection of Glass to Stourbridge, which can be seen today at Broadfield House Glass Museum. John Northwood was the most important person in the Stourbridge glass trade in the 19th century. He was born in Wordsley in 1836, and served an apprenticeship at Richardson's as a painter and gilder of glass. In 1860 he set up a glass decorating business in Barnett Lane, Wordsley with his brother Joseph, where he developed acid etching as a glass decorating process. His most famous achievement was the revival of the art of cameo glass, which had been lost since Roman times. From 1881 until his death he was the Art director for Stevens and Williams. When one looks back over time within the glassmaking industry, ones mind will recall the glass produced over the years in Ireland. Glassmaking in Ireland was not an intentional process, but one, which came about through events mainly in England. When an Excise Tax was imposed in England around 1746 it made the cost for producing crystal glass soar and it became a commodity, which lost its viability in the market place. It was during this time many leading exponents of the glassmaking art, left England and began to set up glasshouses throughout Ireland. Glass in Ireland was not taxable and thus it was an ideal situation for many to exploit. I feel it should be mentioned here that eventually in 1797 a tax was levied on Irish glass, but only on bottle glass, however this gave the makers some fifty years of unhindered production. Hence there was a strong incentive for English workers to start plying their trade where conditions were easiest and Ireland was their first choice. From its earliest days, there had always been a fascination for collectors of Irish glass. Much was cloaked in a veil of sentimentality, many feeling it had an aura of its own, but any study of Irish and English glass reveals that it is by no means easy to differentiate between them. If we look at old illustrations of both Irish and English glass of this period, rarely is there any suggestion of a distinctive difference between the two types. This is understandable, since the new workers in Ireland took with them samples of their wares, which had been made in England, and hence glass items made at Waterford and elsewhere were inevitably copies of English pieces. In this way, history repeated itself, for just as the English had gained the secrets of glassmaking under the tuition of Italian glassmakers nearly two centuries earlier, the Irish now acquired their knowledge from the English. Once the Irish had learnt their craft, they continued to appreciate and admire the beauty of English design and the excellence of its cutting. The leading pioneer of Irish glass in the English tradition was John Hill, a renowned Stourbridge glassmaker. Hill went to Ireland circa 1783, where he worked with two brothers, George and William Penrose, and although his time with them was brief, he was to Ireland what Jacopo Verzelini was to England some 200 years before. In 1786 Jonathan Gatchell, who also worked with the Penrose brothers and later became the owner of the factory, succeeded Hill at the Waterford glass works. Gatchell died in 1823 but various members of his family continued an association with the Waterford glasshouses until 1851. With these facts we can see how the beginnings of Irish glass being produced in Ireland came about. However this knowledge is not of great assistance in guiding the collector to identify the specific places where particular pieces of glass were made. The great difficulty with most glass is the fact it was not marked, as was the case with porcelain and fine bone china of this period. One of the few Irish glasshouses whose name appears on glass was that of the Penrose Brothers. Evidence also exists that some Belfast glass was marked with the name of Benjamin Edwards, who had formerly been a glass worker in Bristol, which would substantiate the reason why some Belfast decanters are in the style of those originally produced in Bristol, that were long tapered ones. Of all the Irish glass houses the most notable is that of Waterford and many believe that such items produced there have a bluish tint and could be recognised by this feature against the white effect of glass made in England. I should say at this point here is not concrete proof in this fact, and most authorities do not accept this as a way of attributing Waterford glass. This was also mention by W. A. Thorpe in his book on English and Irish Glass where he says: "The superstition has already been exposed so often that we need only remark here that a dark blue tint is a very common technical fault in old glass and the numerous imitations of it." The difference between English and Irish glass consists more in points of detail than in any one style, but there is often a certain solidity of effect of Irish pieces and classical designs are also typical. This strengthens the fact that in all my years of collecting and admiring glass, the true attribution of any piece of glass is the hardest thing to undertake, and this will continue to be so for all future collectors of fine glass. The Excise Act of 1746 had another effect on glass being produced in England at that time, in as much as it encouraged the making of pieces of small form and light in weight. This was not conducive to the cutting of glass and hence the Act's adverse effects went through the business of the glassmaker. The Act also forbade the export of glass to Ireland from the English glassmaker, and these two facts coupled together created a host of difficulties for those who were anxious to encourage the production of glass in Ireland. It was in Ireland where the prohibition which affected cutting on Irish glass was first removed which only gave further impetus to its production and to give hope for those English workers setting up glass houses in Ireland. One of the most favourite cut glass patterns of the time was raised diamonds and this effect was to be found on many pieces being made. The shapes of such items as bowls followed very closely to the English designs and were very decorative. Salad bowls often being made in a canoe shape with a knopped stem mounted on a raised diamond shaped base. This was great period in the production of Irish glass and fine examples of such glass are a treasured prize by any collector. The hobnail design, again a great favourite pattern, was a form of criss-cross cutting and this type of decoration often appeared on bowls of Waterford water jugs and cream jugs. Horizontal prismatic cutting was also a common characteristic on the necks of jugs. Towards the end of the 18th century a favourite form of cutting on water jugs was a scalloped rim with additional scalloping on the shaped foot, as well as vesica cutting encircling the body of the jug in rows. Vesica cutting and splits were usual features on such articles as salad bowls and water jugs of that era and the fashion continued into the early 19th century. Decanters of Irish ancestry often display glass rings surrounding and protruding from the neck at intervals in varying numbers. It was only to be expected, once the Irish glass houses began production of the articles, which they turned out in vast quantities, included the same wide range of pieces as those made in the parent glass houses in England. The Irish became very clever at exploiting the designs, which could be achieved by cutting, and the type of glass lent to this new age of Irish cut glass. Some of the pieces being produced were cream and water jugs, honey jars, celery glasses, pickle jars, jam jars and sweetmeat dishes as well as bowls of all shapes and sizes. Numerous wineglasses along with sugar bowls, salt and pepper pots were all in the production lines being produced usually all with heavy and elaborate cutting. Some of the smaller pieces such as the pickle and honey jars produced at Waterford intend to have knobs which are more pointed than those made in Bristol and this can help in identifying whether such an item came from the Bristol or Waterford glass house. Many of the preserve jars were complimented by having added bases, but the butter coolers, which were very popular at the time, usually had no such feature but rested flat on the table. Writhen cutting to be found on such items as salt cellars and condiment sets is also a common feature on fruit dishes, finger and sugar bowls. The writhen decoration is formed by perpendicular ribs, which are impressed on the soft pliable glass in the course of its manufacture. The ribs are twisted diagonally and are closer to each other as they reach the top of the piece. Most writhen effects curve from left to right, but having now made that comment I am sure there were instances when may be a left handed person had them going the other way! It cannot have been easy times for the English glass worker to witness the extraordinary success of their fellow craftsmen in Ireland. For the best part of 200 years, since Jacopo Verzelini set up his glasshouse at Crutched Friars in London in 1570, they had laboured until their workmanship had approached something near to perfection. Now because of the implementation of the Excise Act and other economic difficulties, over which they had no control, the monopoly had slipped from their grasp. Whilst the name Waterford is synonymous with Irish glass it should be mentioned that flint glass had been made in Dublin as early as 1695 and a glasshouse had been set up in Cork in 1783. This glass house was initially set up by three men who are believed to have come from England, namely Burnett, Howe and Hayes, as had John Hill, and this glass house was in production until 1818. There were also glass houses in Londonderry and the Belfast factory having been established circa 1780 continued to make glass as late as 1829. With the export restrictions being removed, Irish glass became a sought after item now in the open market place, although less costly and England being a fairly prosperous country, English glass was still widely sought. Irish glass had made its presence felt and still today continues to hold a fascination for collectors world-wide. Sterling silver is one of the most highly reflective substances of all, for it can be engraved, moulded and shaped into just about any form its artist desires, from punch bowls to candlesticks, goblets to urns. Silver seemed destined to be the star of the show in almost any setting. Unfortunately, good quality silver it is now and always has been very expensive. That was the basic reasons for the creation of mercury glass a delightful impostor that shone in many a home for more than a century. Silvered glass, known most commonly as Mercury Glass, was born in the mid-1800s in England. It's formed through the rather ingenious method of creating double-walled glass with a hollow centre. Next, a liquid silvering agent, silver nitrate, is poured into the space between the two layers of glass, usually through a hole at the base, then it's swished about until it adheres to the walls and coats them in "silver." The remaining liquid is drained off, the piece is left to dry and a glass plug is used to seal the hole. Early experiments used mercury as a main ingredient in the silvering agent, hence the origin of the name for this type of glass, but it didn't work well and was discarded. Nevertheless, the term "Mercury Glass" is now used to label just about any sort of silvered glass to this day. British glassmakers Hale Thomson and Edward Varnish took out the first patent on the process in 1849. Some pieces of Mercury glass can be found to bear the mark of Hale Thomson impressed in the plug disk as being patentee. Six years later, Thomas Leighton of the New England Glass Company took out an American patent. Within a decade, glasshouses all over England, America, Bohemia, Belgium and France were producing mercury glass in vast quantities. Finally, the pristine look of pure silver could be had by even those of more modest means and best of all, you don't even have to polish it! Mercury glass candlesticks, chalices and icons appeared in churches, while it took the shape of everything from doorknobs to vases, salt dishes to plates and lamps in the home. Just about every item that's found in real silver was copied in mercury glass. Plenty of items were quite simple, with just their deceptive silver gleam as decoration. However, other pieces were lacquered with golden accents, decorated with paint or enamel or frosted. Some of the finer, thicker-walled pieces were sturdy enough for ornamental engraving, though most were too fragile to withstand the process. Like most fads that catch on too well, poorly made mercury glass began to glut the market as well, popping up in the form of cheap souvenir items. In the early 20th century, fashions changed and former advocates declared it tacky and common. By the 1940s, it had all but disappeared from the market. It never quite disappeared entirely, however. I was surprised to discover that glass Christmas ornaments are frequently made of mercury glass, along with many of today's collectible figurines like the Coca-Cola polar bears. The most beautiful pieces of all are those that remain from the 1800s and early part of the 20th century, but these are few and far between due to their easy breakability. This once-cheap item scorned by society now has the last laugh. Collectors today pay hundreds and thousands of dollars for the oldest, most unique pieces. Thankfully, not all mercury glass finds are so dear. You might find a pair of mercury glass candlesticks, a set of doorknobs or other pieces from the '30s and '40s starting at a few pounds. Items from the early 1900's are priced from about 75 dollars and upwards. Look carefully, and you just might find that the piece of silver in the antique store window is actually glass. If you're lucky enough to find one of these rare decorative items, buy it and treasure it like the precious treasure it's now become. To the lover of glass, the word epergne conjures up the beauty of the glassmaker's art in all its splendour. So what is an Epergne? If we look at the description in an English dictionary we find it listed as,"An ornamental centrepiece for a table, a stand with holders for fruit, flowers, nuts, etc., probably from the French Epargne a saving. One can see why it is more than likely this was the word, which was adapted and used, for the epergne is an item, which saves space upon the dining table. The epergne or centrepiece can be traced back to their evolution through the archive pattern books of the Stourbridge firms, illustration in contemporary periodicals and the records of the Patent Office Design Registry. Possibly the first type of glass epergne made in England was in crystal glass and consisted of a bowl with one central trumpet. From this early design the development was extremely radical and it was not long before hanging baskets from canes were added to the original concept. Although the design changed the single epergne continued to be made in crystal with engraved or etched patterns according to the fashion of the day. The earliest registration for such flower stands is shown to have been made by Dobson & Pearce, London dealers in June 1861. These first epergnes were almost certainly designed by Daniel Pearce, a partner in the firm, who was a few years later in 1867, described in the Art Journal as "unrivalled in England as a designer of works in glass". Prior to him joining Thomas Webb in the 1870's he had also worked for W. P. & G. Phillips. These epergnes by Dobson & Pearce were exhibited at the London International Exhibition of 1862 and James Powell & Sons also exhibited similar ones. Throughout the 1860's other companies, notably, Naylor & Company designers from London and the Stourbridge glassmakers of Richardsons & Pargeter and Boulton, Mills and Hodgetts, were registering various designs. Many variations on the theme of epergnes continued through out this period of time within the design studios and the glass houses in England. Many examples of epergnes are to be found in the pattern books of Philip Pargeter, Red house Glass Works, Stourbridge, which describes him as a "Manufacturer of registered flower centres, candelabra, vases, specimen tubes and of cut, engraved and etched glass". Many of the designs show elaborate centrepieces with hanging baskets, canes, and applied leaves. It was in the same year as he set up on his own as a glassmaker in 1871 that he registered his designs. Some of his designs being very similar to those of Richardsons which are dated 1867. It is known that Philip Pargeter served his apprenticeship under his uncle, W. B. Richardson, working there as an engraver until 1852. During the period between 1852 and 1863 he had his own engraving shop, but in 1863 returned to his old firm, but this time in partnership with W. B. Richardson and J. W. Hodgetts. The firm was called Hodgetts, Richardson & Pargeter. However by 1871 he was eager to move on, and he set up his own glass works at the Red house Glass Works, where he remained in business until in 1862 he sold the business to Stuart & Sons, who still today have a shop on this site. From the early days of single stemmed centrepieces, we see the development of more elaborate pieces with hanging baskets which had been evident in the ones exhibited by James Powell at the 1862 International Exhibition. In 1866 the London dealer James Greener registered the first of these hanging basket epergnes. The demand for this style of epergne was very great and in 1867 Hodgetts, Richardson & Pargeter registered similar designs, with crimped edges to the main trumpet. This development in design continued during the early years of the 1870's, with the introduction of mirror bases as a substitute for the bowl. Boulton & Mills of Stourbridge first registered the mirror base, which was intended to reflect the flowers as if reflected in a pool of water, in 1871. Their design also incorporated curved barley sugar twist canes, which supported baskets in the shape of bell styled flowers. Also during this period we see a Venetian influence, with the introduction of fern styled leaves. The first registration of an epergne, which incorporated fern leaves, was made by Philip Pargeter in 1873, in a design which also included a mirror base and hanging baskets. Until now most epergnes were made in clear crystal glass with etched or engraved patterns, but now the use of coloured glass became more prolific, and the designs took on a more realistic appearance. With the advancement of the epergne, we see a botanical influence emerging with such items as bulrushes being added in threaded glass. The Stevens & Williams "Description Books" for 1875 show many instances where such expertise of the glassmaker is shown to the full. By the mid 1870's the most popular style of epergne, with a crimped trumpet shaped central vase with matching subsidiary vases or hanging baskets, was firmly established, being modified only by minor changes in shape or added decorative features, and by the increasing use of colour. During the 1880's the only other significant change in design was the raising of the centre of the main supporting bowl into a steep cone, so that the metal socket block was well above the rim of the bowl. In both the 1870's and 1880's we see the advancement of colour in all types, and shapes of epergnes and the further involvement of most of the major English glassmakers undertaking production of the centrepiece. Ruby, blue and amber and many shades of tinted opalescent colours ranging through pink, citron and turquoise were all used as well as embellishing the pieces with frills and crimped edges. Thomas Webb & Sons renowned for their "Queens Burmese" produced a variety of epergne in this famous finish, and today these command a high price when they become available on the market. With so many variations on a theme, the epergne did not see any further development during the next few years, and it is a mark of the glassmaker art that they continue to be produced today, in reproduction form. During the Victorian era, leading wholesalers and importers such as, Silber & Fleming produced a number of catalogues which illustrated numerous types of epergnes by many different makers, and attribution to a particular manufacturer can be hard as many epergnes were being produced overseas. Epergnes were not just produced in all glass, many had hanging baskets supported on silver or gilt stands and many fine examples of this style can still be found today. The major concern for this style of centrepiece is the originality of the glass for the metal stand. The epergne and the rustic stem vases were all mentioned frequently in the Pottery Gazette with glowing attributions to the glassmakers of the time. It was not just the Pottery Gazette which made mention of this tableware, for we find in Mrs. Beeton's Book of Household Management date 1915, recommending the use of 'rustic' tableware, remarking that they are extremely pretty although rather old-fashioned. As previously stated the firm of Thomas Webb & Sons produced "Queens Burmese" and the most popular use of this type of glass was for "fairy" lights, as patented by Samuel Clarke. Apart from single "fairy" lights they developed the use of such items into epergnes and many fine examples now command high prices. It seems there was no limit to the ingenuity of glass manufacturers in producing an endless wide range of interpretations of the epergnes. One is left with no doubt that the symmetrical flower stand with a central trumpet shaped vase and subsidiary vases or hanging baskets, developed in the height of the "Victorian" era remained very popular and today are very sort after collectable pieces. 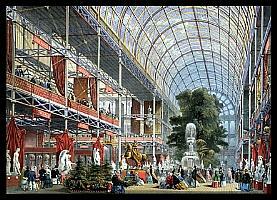 'Bristol' Glass was evident on the trade stands at the Great Exhibition of 1851. Out of all the words used to describe glass by collectors and dealers alike, the use of the word Bristol is by far the most misused. Many apply the name to transparent blue and green glass, others however claim all white opaque glass and especially painted pieces to be Bristol. I once heard of a dealer calling a vase Bristol when in actual fact it was made of bone china. This surely shows what confusion there is in identifying true Bristol glass. So little is known from reliable sources that the whole matter of identification and attribution can be a minefield for the amateur collector. Some of the content of this article is fact but much can only be surmised, not only about the kind of glass but also about some of other kinds of coloured glass which have been over the years have been mistaken for Bristol. Opaque glass is basically a glass, which has been made in such a way that you cannot see through it, although you may be able to see light through it. So what made English glassmakers enter this field of Opaque glass? There are numerous reasons why this style of glass was made during the middle to late eighteenth century. The main reasons were the introduction from Germany and Italy of milk-white glass painted with enamels. England during this period was like many other Western countries receiving shiploads of fine porcelain from the Chinese continent. But possibly one of the most plausible reasons was in the fact parliament in 1746 had levied a new Excise Tax on clear crystal glass but not on opaque glass. Hence place like the Bristol area commenced production of opaque glass and in no time it became very popular and was relatively cheep. In Germany glassmakers had already made attempts to rival the new hard-paste porcelains of Meissen and Vienna and those of soft-pastes produced by Saint Cloud and Chantilly. During this period we also saw and emergence of early porcelain factories in England, namely Bow, Chelsea, Worcester and Bristol. Bristol was soon to adapt from the delftware products to that of the opaque glass pieces, which could be decorated in the same way as porcelain and by the same workers. Even during those early days in the glassmaking industry, it was understood that glass could so often mimic porcelain but porcelain could not mimic the properties of glass. We must start somewhere and where better than looking at the kind of glass, which, though it may also have been made elsewhere, seems upon evidence of testimony and reason to have been made at Bristol. We know this form of opaque glass was developed at Bristol and therefore it is so easy to understand why some pieces are mis-attributed. This form of glass is a dense opaque material, soft and smooth to the touch and as white as porcelain, which has lead in the past for some to mistake it for porcelain. The ancestor to Bristol glass was a glass made by the Venetians. It was well known all over the European continent, and according to Neri L'Arte Vetraria, published in Florence in 1612, it then included 11.75 per cent of tin oxide in a typical mix of the Venetian lime soda glass. Delftware makers in the Bristol area were already using tin oxide and it was not surprising that the glassmakers soon followed in their practice. The delftware makers use tin oxide to provide an opaque white glaze on earthenware, upon which they painted gorgeous polychrome tulips as well as blue and white landscapes. Decorators working in the Delftware industry also were use by the local glassmakers and therefore similar designs appear on both Bristol glass and delftware. Venetian lime soda glass was a very different type of glass from the heavy English crystal glass. It was soon discovered that the Venetian formula for opacity would not work with the English variety of glass. 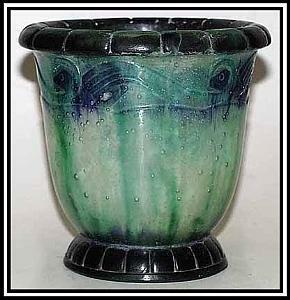 Hence, the English glassmakers evolved a lead potash glass, which needed less that one per cent of tin oxide to look like porcelain and at the same time retains the fine smooth heaviness of the English lead glass. To make this form of glass tougher and more durable, they gave it a double annealing, whereby the glass is slowly cooled and strengthened by being drawn through a leer tunnel. This form of tin oxide opacified glass has often been dubbed with the word enamel, which also adds confusion to identification. At this point I feel one should explain what confusion the word enamel can create within the realms of the glass collector. The main reason why this word is used to describe this form of glass is mainly due to the fact the early makers advertised it under that name. All the same it is a confusing tern, for the glass is neither true enamel nor true glass. The word enamel is already used in connection for painting with enamels, which is a combination of glassy flux and pigments. Enamelling may be done on glass, as is the case with the famous Beilby glassware, on porcelain as in Chelsea and Worcester examples, on pottery as is the case with Staffordshire salt glazed stoneware and also on metals. So we are left with this descriptive legacy and must therefore remember this when describing Bristol Opaque White Glass. We now know the fact what Bristol glass is, but what kinds of objects were made in this new glass? Obviously when comparing Bristol glass objects with those of unqualified success produced by the leading porcelain makers, certain objects are conspicuous by their absence. Teapots, cups and saucers to name but three items. What we now have to look at is why these items were not produced in Bristol glass or if they were no documentary evidence can be found. Perhaps the best answer to this question is that Bristol glass was not very good at resisting heat, although I doubt if we will ever know this for sure. For if a teapot had been made in Bristol glass I very much doubt if anyone now owning one would test it with boiling water. Whilst we may not find evidence of Bristol glass being used to make teapots and cups, there is evidence of other tea ware items being produced, including tea-caddies, cream jugs and sugar bowls. However, the main use of Bristol glass was in the production of bottles, for which the area was already renowned, and many different forms of vases. Some of the bottles were made small like those of the Chinese porcelain ones, and were offered in competition with the import Chinese porcelain variety which were not only imitated but also adored by many all through the late eighteenth and nineteenth centuries in Britain. We find that opaque glass items are not so varied or diverse as those made in porcelain. This was mainly due to the fact the glass blower was confined to shapes by their own ability to blow and mould the piece compared with the art of the potter who was able to compose their items by throwing by hand or to cast in moulds. However the glass-blowers inability to make all shapes was more than made up for by the richness and the variety of decoration. To many the decoration is the main interest to many a collector. Much of the decorating of opaque glass was done by transfer printing, in the same way, as were stoneware, earthenware and porcelain pieces. England can be heralded as the pioneers of this form of decorating, either at Liverpool or Battersea, although exact confirmation cannot be established. Within our look at opaque glass it would be remiss if we did not mention the Liverpool firm of Sadler & Green. The firm was renowned as, black printers and was responsible for all or most of the transfer printing on opaque glass. Bristol cannot be listed as a place where such decorating was carried out, as it would appear that all opaque glass from Bristol was sent to the Liverpool Company for decorating. The firm were originally engravers of prints, either for framing or for insertion into books. It was the founder John Sadler who initially noticed that for a transfer to remain it needed to be fixed by firing the object. Transfer printing had also another advantage to the hand painted items, it was far cheaper to undertake. Transfer printing was achieved by a design from a copper plate being printed on glass, pottery or enamel by means of a paper transfer, much like the ones used by children today. The process was to ink and engraved copper plate with an ink prepared from a metallic oxide, and then transferring the design to paper which, whilst the pigment was still wet, was pressed onto the glass, leaving the desired imprint, this was then subsequently fixed by firing. Henry G Richardson & Sons of Stourbridge were renowned for transfer printing on many of their opaque glassware. Evidence is that this technique was greatly used in the production of Russian glassware. Whilst transfer printing may have been a cheaper way to decorate Bristol glass enamel painting was also a very favourite way of decorating items. The most common form of decoration in enamel painting was floral and oriental motifs. We find that the Chinese influence was very evident in decoration and often find scenes of oriental ladies and gardens depicted on such glassware. The talent of the painter was for all to see and many fine examples are now in great museums throughout the world. Painters, enamellers and guilders employed within the pottery and porcelain industry, undertook the matter of decorating, as opposed to glassmakers carrying out the decorating process. Evidence of one of the first decorators of Bristol Glass was Michael Edkins, who arrived in Bristol from Birmingham around 1762. Edkins was renowned for his painting on Delftware pottery and evidence of his work can be found in the Victoria and Albert Museum in London. Michael Edkins lived to a ripe old age of 98 and during his life was father to thirty-three children. Bristol Glass or Opaque glass was not just confined to the Bristol factories and soon vast quantities were being produced in the Stourbridge area. The names of such great glasshouses as Richardsons, Northwood and Stevens and Williams all are connected with the production of opaque glass. Bristol Glass should not however be confused with Milk Glass, which is much collected in the Unites States and incidentally is nothing like the Milchglas of Germany, but is more like slag ware produced in England. Milk Glass within the United States was produced in many shapes and forms, especially animals and the hen on a nest being the most produced item. Most Milk Glass was and is produced in the tradition of pressed glass. Dealers and collectors within the United States appear to classify Bristol and Opaque White glass under the banner of Milk Glass, which is totally incorrect. This may have a knock on affect in as much as Bristol Glass is by no way so desirable or collectable within the US. To most collectors and dealers the word Bristol is synonymous to a blue coloured glass but when enthusiasts also mention the word Bristol in conjunction with glass, we should also remember Opaque glassware with its lavish decoration. Most theories as to the conception of iridescent glass would lend to the belief it originated in Bohemia about 1863 with J & L Lobmeyr being the pioneers. However records show that at the Crystal Palace Exhibition of 1851, the Birmingham glassmaker Lloyd and Summerfield exhibited glass vases of such colouring that descriptions of them given in the official exhibition catalogue imply they had an iridescent surface. It is also recorded that Mr. Summerfield travelled extensively and had many chances to see European glass being made and to discuss glass with the makers. English iridescent glass, which was mostly, produced in the Birmingham and Stourbridge areas, and in vast quantities, leaves the task of identifying very difficult. If it were not for the English glassmaking techniques and design characteristics, the task would be quite impossible. Thomas Webb & Sons were possibly the first English glassmakers to enter the field of iridescent glass, around 1880. After some experimenting, they designed and made a glass they called Bronze Glass. This type of iridescent glass is regarded as one of the very best forms of such glass ever produced. They also continued to make other iridescent glass, but their Bronze glass pieces worth as many pounds as normal iridescent glass is worth pennies. How does one distinguish between Bronze and other iridescent glass? In most cases iridescent glass is always lighter in weight and the surface is very rarely mould decorated. Applied decorations are often found on iridescent glassware such as applied drops. These are found in many colours with some being multi-coloured. Webbs were renowned for a shell motif having fifteen points, which was used in a number of colours and on various pieces. The pontil mark is also another aid to identification. As the base of most iridescent glassware is rather thin, the original pontil scar is usually not ground out. Also, the top of the item may be wavy or straight but never ground flat. Both enamel and gilt decorations are not evident on much iridescent glassware and when used are mostly of a floral nature and generally depict common garden flowers such as the forget-me-not. These means of identification only apply when the colour of the iridescence is the same as Webb's 'bronze' glass. Webb's pattern book of 1878 refers to green as well as bronze and both being produced in plain and crackle effects. The type of crackling is unique, and it does not appear to be duplicated in any other glass. These marks are hair-like in appearance, usually close together and sometimes make the surface feel rough. Basically Thomas Webb & Sons produced three types of 'Bronze' at their factory. Their plain surface was predominately used on shapes resembling Roman & Greek vessels and they were heavy and had thick sides. The moulded type was more decorative and very often the shell decoration was applied to this type of 'Bronze'. The final type was rather a humorous version, with an owl's head formed on the surface and the pieces nearly always had enamelled decorations. Although officially bronze and green were the only colours used by Thomas Webb & Sons for their 'Bronze' range of glassware, ex employees have said that most other colours were tried out. Nearly every English glassmaker is associated with the making of iridescent glass and techniques practised were very similar in each company. It was basically subtle differences in decoration of pieces, which allows one to identify glassmakers of any one particular item. The two most significant and prolific producers in the Stourbridge are, Stevens and Williams and Thomas Webb & Sons both had designers who specialised in this field of decoration. Stevens and Williams being very much associated with applied decoration of fruits and flowers. The cherry being one of the most used in this applied technique. One should point out that applied decoration is not solely used on iridescent glass pieces but it adorned may types of glass. With the lack of clear identification on glass items as to the manufacturer, it can be somewhat of a minefield for the collector in the first instance. However, as time passes, with the research into glassmakers of old, we see current glassmakers making amends and most art-glass producers now subscribe to identifying their creations. Many of the techniques used so many years ago are no longer used for many reasons, none so more so than the indiscriminate use of toxic chemicals and poisons, which through the advent of Health & Safety in industry has levied standards on such processes. Iridescent glass was produced by using such chemicals now forbidden and we find the new technique is to spray the molten glass with acids to achieve this much sort after effect. The iridescent effect clearly imitates the finish we find on excavated Roman Glass, which shows the sign of times being buried in the earth and reacting to natural chemicals such as iron oxide. With the success of Webb's Bronze glass, John Northwood, who working at this time for Richardsons was inspired to produce a similar style of glass. Richardsons iridescent is scarcer and eagerly sought by collectors. Most of Richardsons' production has a moulded surface and is very heavy. The glass itself is of green similar to Webb's but the lustrous surface reflection is a deep purple colour. Richardsons experimented with iridescent glass more than any other Stourbridge glassmaker. The result was a number of rare and special pieces. In many instances the surface is completely smooth, the colour being more slate than purple with a matt finish and all reflections are neutralised. The manufacturing difficulties incurred in the production of this type of glass must have been many for no evidence can be found of other Stourbridge firms producing this lustred glass with similar surface finish. Pearl iridescent glass was also produced by Richardsons, which involved coating their 'Opaline' or 'Alabaster' glass with crystal overlay and then to iridize the surface. This finished surface resembled mother-of-pearl and is often referred to as such by many dealers and collectors. Much of this pearl iridescent glass produced by Richardsons was decorated with applied glass snakes or drops, which were applied prior to the final iridising process of the piece. This type of glass, 'Pearl Iridescent', has been copied many times, nor more so than by Czechoslovakian glassmakers. Both were blown in a dip mould, the surface pattern, resembling a six-sided honeycomb, is raised and the colouring is identical. However, there is a difference, the Richardson type is very much heavier and a great many pieces have applied rings and drops in various colours. Also, the top is scalloped which, together with hand manipulation of the piece, intends to distort the pattern in the glass towards the top. The Czechoslovakian version of this ware does not have these characteristics and is much lighter in weight. These differences also tend to support the fact that English glassmakers made this type of glass with more emphasis placed upon perfection, whereas with Czechoslovakian glass we tend to see more massed produced items. Because, iridescent glass was so easy to make, the small one-man businesses know as 'Cribs' in England produced a fair amount of this type of glass. With so many pieces being made by the 'Cribs' this only adds to then difficulties in identifying pieces to specific glassmakers. In the first instance, glassmakers tried to mix the metallic lustering oxides with the glass batch, but it soon became apparent that the various oxides could be applied to the surface of the items. This also proved to be a cheaper and easier method of production. After the piece was formed it was placed in a chamber into which the fumes of various oxides were blown. The fumes attacked and attached themselves to the surface of the glass, which ultimately resulted in a very highly iridescent finish. Another factor in achieving the degree of iridescent finish was determined by the length of time the pieces were left in the chamber. Another common method used to produce similar results was to paint a lustering compound on the surface of the glass while it was being worked at the furnace mouth and was still in a molten state. The cheapest, easiest and most common method of iridising glass was to spray a metallic solution on the glass before it went into the 'Lehr'. (Annealing oven) However obviously the depth of the iridised surface is very shallow and after examining some iridescent glass made in Czechoslovakia, Frederick Carder of Steuben Glassworks was noted as saying; 'Rub it hard enough and the colour will come off'. Iridescent glass manufacture certainly highlights the fact that when comparing English with Czechoslovakian glass, the main difference is English glassmakers have always been 'production minded' whereas their Czechoslovakian counterparts have nearly always placed their emphasis on quantity rather than quality. One other English glassmaker of note in iridescent glass production was Lloyd and Summerfield of Park Glassworks, Springhill, Birmingham who manufactured a series of vases in the shapes and colours of onions and leeks with an iridised surface. Yes the same company who exhibited at the 1851 Crystal Palace exhibition. For most collectors of glass, the word Burmese conjures up a form of glass, which at first sight could be mistaken for fine porcelain, as well as its legend carrying a certain fascination. The manager of the Mount Washington Glass Company in Massachusetts first patented Burmese glass in December 1885 at the time, Mr. Frederick Shirley. This type of glass was exclusively made at the Mount Washington factory. It was the intrigue and fascination of this glass, which caught the attention of Queen Victoria, having been, sent few pieces as a present. So readily impressed she immediately ordered a large tea service and many other pieces. She was also instrumental in obtaining the rights for an English company to make this so sought after glass. Her efforts paid off, and in September 1886, Thomas Webb & Sons of Stourbridge were permitted a licence to manufacturer it and commenced producing the glass. Once Burmese glass has been seen, especially in the correct ambience, it is understood why Queen Victoria was so taken by the subtle colouring and the beauty of this type of glass. To those who do not recognise Burmese glass, it is semi-opaque of a deep shade of pink that graduates to the palest of yellow green at the base of the piece. The whole item having a fluorescent appearance. Many items in Burmese can be found on display at the home of the Glass Association in the UK, the Broadfield House Glass Museum at Kingswinford in the West Midlands. Burmese was a truly high quality type of glass and soon became must sought after by many a person. The influence of the Queen may have played an important part in projecting this newly discovered glass. 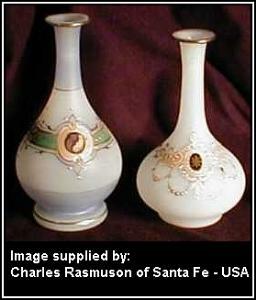 During this period Burmese glass was only rivalled in popularity by Cameo items, both in production costs and demand. The cost is not surprising as two of the most expensive additives, namely gold and uranium were used in its production. The finish to the glass was matt, but evidence shows that certain pieces were polished to give a glossy sheen. Thomas Webb & Sons soon became innovative in decorating finished pieces with enamel and gilding. 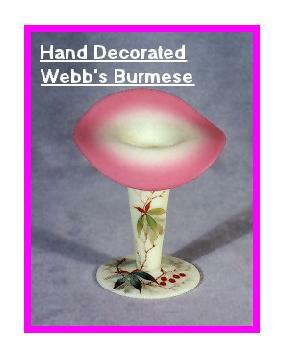 Their leading artist, Jules Barb, renowned for his gilding was certainly amongst many who decorated 'Burmese' glass. The decoration on Burmese glass is always of fine quality, giving the impression that the decoration is fused into the glass. Other times the flowers appear to be raise from the surface. A pattern, which has become synonymous to this type of glass, is a decorative pattern of Michaelmas Daisies, which became known in America as the Queen's pattern. This style was then to become known as Queen's Burmese. To our Victorian ancestors, the word radioactive was not within their vocabulary, but today we fully appreciate what the word and its effect can have on mankind. It is clear they were oblivious to the sinister properties of the colouring agent, uranium. Uranium imparts a fluorescent quality to glass and in 1896, eleven years after its creation, Henri Becquerel investigated the properties of this additive and only then was it discovered the substance was radioactive. Madame Curie also investigated the effect of radioactive properties and isolated two further natural radioactive elements, polonium and radium. It would appear Burmese glass was a potential hazard. The dangers of handling raw uranium were evident, both from her death of leukaemia, which was a direct result of radiation received during her investigation and the tragic history of uranium miners of that period, who died of lung cancer from inhaling the dust and gases. It was only in the 1950s and 60s that stringent regulations were placed upon the use of this raw material. Today we understand the properties of uranium and the adverse effects it can cause the human being. Many a collector of Burmese glass will have wondered what effect such glass can have today, especially from pieces within their collection. Investigating the radioactivity in Burmese glass, the energies and intensity of the gamma rays emitted needs to be examined. For this a sensitive Geiger counter was used to determine the emission of the gamma rays, which correlated with those from uranium salt. Whilst this method can demonstrate that 'Burmese'glass does emit gamma rays in sufficient quantity to allow detection, it should be emphasised that the glass does not pose a problem to anyone having this type of glass within their collection. A luminous alarm clock emits far more rays. In the days of Queen Victoria, people were subjected to no more gamma rays from 'Burmese' that anyone today is from cosmic rays, materials in out homes or those emitted from the radioactivity of the planet. From experiments carried out on 'Burmese'glass it indicated the uranium was evenly distributed throughout the piece. Gold being used within the glass batch accounted for the pink shading which only became evident when reheated at the glory-hole. With unequal heating it caused the piece to merge in colour. Certain pieces can be found with very little of the pinkish colour which would suggest that the piece was dipped into gold at a later stage of production. Gloss or polished Burmese usually has a more significant amount of pink colour, which was probably due to the extra time of firing required for the polished appearance. In dull light the bases of Burmese pieces take on a greenish colour and the pink becomes dusky. These properties were ideal for the use of such glass as Fairy Lights for which Samuel Clarke was most famous. As shades they emitted loveliness when illuminated and this did not go unnoticed at the time. In the Pottery Gazette of January 1887 the Burmese fairy light was described as; 'The loveliness when lit is of perfectness that radiated heat alone can effect'. Burmese shades became ever more popular through the astute advertising Samuel Clarke gave them, it would appear this type of glass was here to stay. However within a five year period, change was afoot, and the popularity of Burmese glass declined. Whether the change in taste, restrictions on gold, the scarceness of uranium, or the coming of the electric light played a part in this change can only be speculative. Over the years we find some dealers who believe Burmese glass was faked or reproductions were made. It is most unlikely that a batch formula omitting the uranium or gold content could possibly produce a credible alternative. In 1940, it is reported that a find of a batch of Burmese glass was made at the Mount Washington Glass Company, which at that time bore a different name. It is understood that certain pieces were made form this batch and became known as Gunderson Burmese after the manager of the time. Their colour is somewhat weaker and the items heavier that true Burmese. However these can not be classed as fakes, for in normal sense of the word, as they were produced from the old mix and are obviously of interest in themselves. Varying pieces were made in Burmese but the most common pieces were not only Fairy Lights but also Jack in the Pulpit vases. Evidence of Mount Washington and Thomas Webb & Sons producing this style of vase can be found within the collections of may lovers of this style of vase. Within my own collection I have examples of such pieces. Burmese glass has left us a legacy, of that we can not deny. Pieces survive to this day showing all their splendour of the master craftsmen who toiled to produce a glass second to none. The early beginnings of French glassmaking are linked with the expansion of the Roman Empire. The regions of the Rhine-Seine area always regarded as particularly flourishing produced early well-designed and individual glassware. However, I do not attempt to confuse the article with details of the forerunners of the famous French glassmakers we have all come to know. Every country has had forerunners within the glass making industry and France is no different in that respect. Whilst England can boast the names of such as Thomas Webb & Sons, Stevens and Williams, Richardsons and Whitefriars and America the great names of Tiffany, Steuben and Fenton, France also has an array of names, which every collector of glass will know. In France, as in central Europe and in England, the production of fine glassware in the middle of the 19th century was mainly divided between cut crystal and coloured wares. It was during these years that the French glassmakers were becoming internationally known and admired for their paperweights, which mostly consisted of coloured patterns. The larger factories, particularly Baccarat and Saint-Louis, continued to participate in the international fashions of the rest of the century and beyond. France by the mid nineteenth century had gained a reputation as one of the most important producers of fine luxury glass with excellent cutting, enamelling and gilding. The distinctive French 'Opaline' glass became a fashionable refinement with a place in every home. A cheaper substitute for opaque white glass was the so called 'alabaster' or 'pate-de-riz' in an unappealing greyish-white. Most French glasshouses produced 'Opaline' and a large quantity of excellent coloured glass was produced by the glasshouse at Patin, which according to records was originally sited at La Villette under E. S. Monot. During the French Revolution the old dynasties of the French glassmaker had disintegrated. Official support in the form of competitive exhibitions invited the arts and crafts industries to display their best efforts to a large public, and individual glassmakers were encouraged to demonstrate their skill and ingenuity in their chosen way. By the mid-nineteenth century a renewed desire for Italian inspired glass techniques resulted in interesting concepts of bright colour contrasts and millefiori, striped, spiral and latticino patterns as envisaged by Georges Bontemps in his 'Guide du Verrier'. These glassmakers were the forerunners of the most brilliant period in French glass as expressed by studio work of the Art Nouveau period and epitomised in the ideals of Ecole de Nancy. In the late 1860's and 1870's three individual artists were experimenting in glasswork, and all of them were represented at the International Exhibition of 1878 in Paris. The first was Joseph Brocard, who was studying the enamelling of glass and whose main ambition was to reproduce medieval Syrian style glass. The second was Eugene Rousseau, a commissioning dealer in ceramics who had turned to glasswork at the end of the 1860's and was at the height of his achievement in the next few years. Typically his glass pieces were thick walled and translucid, often with interior crackling and shot with random streaks of colour. The third of the individual artists at the 1878 exhibition and the best known of them was Emile Galle of Nancy, who had been experimenting in glasswork since about 1867. His earliest work was in clear glass, lightly tinted and decorated with enamel and engraving, but enough about this master in glass design until later. Any country will have top-line makers and those who made France famous for glass must include such companies as: ~ Galle - Lalique - Daum - Baccarat - Clichy and Saint Louis. But others have also left their mark in the collecting circle and they are fully worth mentioning, Verlys - Sabino - Rousseau - Argy-Rousseau - Leveille - Marinot - Navarre - Schneider and Hunebelle. One current glassmaker who is also making his mark on the art glass scene in France is Jean-Pierre Cinquilli. Many admirers of French glass have written much on the more notorious names but in this article I would like to give an insight into all those that I have mentioned and one or two others that are not so renowned. So one might as well commence with possibly the most well known that of Emile Galle. The work of Emile Galle is now much sort after and commanding high prices whenever a piece comes up for sale. So popular that it has forced others to imitate the cameo glass, but to any keen collector one can see the inferior quality of the pieces. Much of this reproduction of Galle's work is clearly marked 'TIP' which I feel is rather an unfortunate signature! Totally Inferior Product! One can argue against reproduction items but one must always bear in mind that it could also be considered flattering. However and no matter what ones opinions is on reproduction pieces that I will leave for another time. Emile Galle was born in France in 1846. His father owned a glass and ceramics factory in Nancy, but Emile initially showed little interest in following in his father's footsteps. He trained in art, botany and chemistry, all of which eventually helped him create the glorious artwork we find today in museums and private collections world-wide. First, however, Emile joined the French armed services, fighting in the war between France and Prussia. After working for some time in the glass company Burgun, Schverer et Cie in Meisenthal, Galle eventually ended up back in his home town of Nancy, where he set up his own glass studio in 1873. Galle began by making classical glass with intricate enamelled designs. From there, he experimented with botanical themes that also used enamelling. It wasn't until the 1878 International Exhibition in Paris that Galle discovered new avenues inspired by the works of John Northwood, Joseph Locke and Eugene Rousseau. Galle started expanding his horizons, and eleven years later, exhibited his own work at the 1889 Paris International Exhibition. His new types of glass, including carved cameo work and many new colours, earned him recognition in the French Legion of Honour. His masterpieces, which he called "Poems in Glass," took hours of patient work and weeks of planning. Galle used a multi-layered, multi-coloured glass technique, etching the glass with acid to obtain a cameo effect. These magnificent works of art are inlayed with gold and platinum and etched with poetic inscriptions, and can today reach prices of more than USD170,000. Galle designed the art, but it is believed that he never actually made any pieces. Galle also produced glass that was less expensive to make but which still commanded a place within the market. It was certainly good enough for him to sign, and it came to be called "Industrial Galle." These pieces still fetch great prices at auction, often around USD6,000 or so each, but nowhere near the cost of his masterpieces. A six-colour, three-inch by four-inch Galle vase recently sold on e-Bay for USD6,500. However, I strongly urge you to make arrangements to verify the authenticity of a piece prior to buying it. Emile Galle won many awards and recognition for his work throughout the 1890s, building a massive new glassworks and employing craftsmen who worked to his exacting standards. Galle died on 23rd September 1904 from leukaemia, but his widow continued to run the factory until 1914, when the First World War forced its closure. She marked all the glass sold after his death with a star after the name Galle. Emile's son-in-law, Paul Perdrizet, reopened the glassworks after the war and focused on two and three-layer cameo glass, acid-etching landscapes and floral designs. Although he enjoyed some popularity, tastes changed and he eventually closed the glassworks for good in 1936. No other name sets collectors' pulses pounding like that of Rene Lalique for his wide range of talents are quintessential and can not be surpassed by any other leading designer of his time. Although his glass creations are some of his most famous pieces of work, his jewellery and metalwork are equally distinctive. Lalique began as a jewellery designer in the Art Nouveau period in the late 1800's, and his career in glass didn't begin until he was nearly 50 years old around 1910. It wasn't long, however, before his creations became some of the best and most prized glass designs of the new century. Rene Lalique first became a jeweller's apprentice at the early age of sixteen. He studied the jeweller's art for two years in London, and though he likely learned much about traditional style and design from the Arts and Crafts Movement, he quickly made a name for himself by creating dynamic pieces in materials and naturalistic themes no one else had ever envisioned before. It's his work with jewellery that eventually led to his second career as a glass artist and designer. Rather than using diamonds in his designs, he incorporated enamelling and various different glass accents among many others. He began to experiment more and more with glass in the 1930's, immediately fascinated by the fluidity and endless possibilities of the medium. His fame had spread far and wide as a jeweller when he opened up his first retail salon next door to Francois Coty's perfume company in 1905. The pair lamented the boring, plain-Jane pharmaceutical bottles that were traditionally used to sell perfume, which most perfume buyers would then transfer into their own cut glass bottles. Coty commissioned perfume bottles from Lalique that broke the mould and better showcased each special fragrance in a bottle all its own. More and more, glass became the focus of Lalique's creative fire. He was nearly 50 when he rented his first glassworks in 1909 near Fontainbleau in France. Before long, he was designing perfume bottles for the top fragrance houses, such as Guerlain, Houbigant, d'Orsay, Worth and many, many more. Some collectors spend a lifetime in the pursuit of Lalique's perfume bottles alone, the oldest and most rare of which regularly sell for tens of thousands of dollars today. But this is just the tip of the Lalique collectable glass iceberg. Lalique experimented early on in his glass career with the Cire Perdue, or 'lost wax' technique, which resulted in fabulous one-of-a-kind creations that he sometimes marked with his thumbprint. Today, these are among the rarest of the rare, and fetch prices soaring into six figures. Fortunately, not long before he opened his glassworks, he started to change his focus to the production of high-quality mass produced mould-blown and press-moulded items for a larger and very appreciative pool of collectors. Some of the same Art Nouveau themes that fuelled his jewellery passions crept into his glass designs, such as breathtaking scenes from mythology or creatures from nature like fish, snakes and dragonflies. These themes paraded joyfully on shapes ranging from tableware suites to vases, stemware to figurines, inkwells to boxes, bookends to perfume bottles and even a line of 'car mascots' designed to grace the bonnets of some of the world's most prestigious automobiles. When he showed some of his best pieces at the Paris Exposition des Art Decoratifs et Industriels in 1925, the event that coined the term 'Art Deco', he won a great number of medals. From that day forth, he earned a place in design history as one of the Kings of the Art Deco movement. a] For he is an artist in an artist's sense of the word, his knowledge is so secure that he is able to bring elimination to a fine point, each line of his design is essential, he never strikes a false note. b] Lalique served a long apprenticeship, he began life as a goldsmith and jeweller. This helps to explain the beautiful delicacy of his work and the extraordinary detail which he introduces into his glass work, detail which, though it delights the eye, never obscurers the meaning and pleasure of the whole design. c] The simplest forms of nature delight him most, and in his translation of them one sees one of the most attractive facets of his genius. d] With his human figures the chief thought which comes to one's mind is their rhythm. One knows, of course, that they are static, but the feeling of movement is so brilliantly expressed that one subconsciously carries on the movement and the figures live again. e] When he uses colour always with great restraint, it is always to enhance the meaning, be it a hunting scene with archers he chooses dark ruby, be it mermaids and fishes he takes the pearly blue light over the sea at dawn. His company and its craftsmen created panels to decorate luxury compartments on railway carriages for the French railway. The French Ocean going liner, 'Normandie', launched in 1932 was a travelling exhibition of Lalique's artistry in glass. The main dining salon being some 305 feet in length, 46 feet in width and 25 feet in height, had walls constructed of thirty-eight glass panels and two gigantic chandeliers and twelve decorative standard lights of Lalique glass lighted the room. The 'Normandie' was commandeered by the United States and renamed the USS Lafayette to be used as a troop ship during World War II. However, she was never actually used as such, for she caught fire and capsized when four tall metal lighting stanchions were being dismantled on 9th February 1942. She was finally refloated on 27th October 1943, some eighteen months after capsizing, but was finally sold as scrap. One can only wonder what ever happened to the work of the master glass craftsman, Rene Lalique. Architectural glass was one of his most important contributions, for Lalique's churches and shrines are outstanding works of modern ecclesiastic art. He designed complete altars with crucifixes, candlesticks and reredos of molten glass. The glass panels, window back of the altar and the glass altar rail in the Chapelle de la Vierge Fidele all have the Madonna lily as a motif. He also designed many figures of the Blessed Virgin and other Saints. Lalique was often commissioned to make pieces and one such example was what has now become known as 'Angel Doors'. Angel Doors were commissioned from the artist for the James Oviatt Building in Los Angeles and constructed from moulds and the doors are one of the largest pieces of sculptured lead crystal Lalique ever produced. Internationally famous by the time these doors were made and exhibited in 1927 at the Salon d'Automne, Lalique had brought a renewed vitality to the manufacture and design of jewellery and glass. The artist's interest in sinuous rhythms and complex interplay of line was part of a larger international vogue for Art Nouveau, a movement that popularised the use of abstract patterns in the applied and graphic arts. The Angel Doors are now to be found in the Utah Museum of Fine Arts having been donated as a gift to the museum by Mr. and Mrs. John M. Wallace. Though some of his designs came in fabulous, rich jewel tones, he is most known for his world-class opalescent glass and pieces in his signature style of frosted glass. He often used frosted glass on specific parts of a piece to highlight the relief and depth of the design. Rene Lalique died in 1945, but his designs continue on just as bold and full of life as ever, and some of his originals are still in production today at the thriving company he left behind. First his son Marc, then his granddaughter Marie-Claude took the helm of Lalique and added their own artistic imprint to the company and its many beautiful glass Objets d'Art and other products. Collectors all over the world adore Lalique glass, not only for its inspired shape, colours and design, but also for its ease of identification. Prices, of course, reflect what you'd expect for items that are some of the best the 20th century has to offer. The oldest, best known and most rare Rene Lalique perfume bottles, car mascots, vases, sculptures and other items regularly fetch tens of thousands of dollars. New items made from the old designs in Lalique's high-quality crystal glass are priced much lower, but still often start at about USD1,000 on up. More recent and common perfume bottles and small figurines might well be the way to go for new collectors without breaking the bank, priced from less than USD100 each. Similar to the concerns and methods of Emile Galle and other glass manufacturers in the Nancy region, the Daum brothers valued glassware for its beauty and fine craftsmanship. They produced hand-crafted vessels with the aid of new technology and methods of production. Their continual experiments resulted in new methods and effects in glass. These allowed them to achieve the desired effects using labour saving technical methods. The Daum brothers Auguste and Antonin built a vast industrial art production facility from a small glass factory inherited from their father in 1879. Though neither brother trained specifically for the overtaking of the factory both eventually became interested in its success. Auguste, the elder brother, trained for the legal profession but later decided to enter the family business. He immediately began to study glass manufacturing processes and became a technical expert as well as a capable administrator, handling the commercial and financial side of the business. Antonin received his engineering diploma and concentrated on production. He followed the most advanced trends in the decorative arts at the time. The excellent management and family solidarity of the brothers greatly contributed to the success of the firm, which still is in operation today. The brothers used techniques known within the glass manufacturing business to produce vases and glasswares of exquisite beauty. For this reason, Daum glassware physically resembles that of Galle and the other glassworks of the Nancy region. Expositions gave the Daum brothers the opportunity to showcase their work while exposing it to a wide audience. They showed at the Chicago Fair of 1893, and in Brussels in 1895 and 1897, where Antonin was awarded Legion d' Honneur. In 1900 at the Paris Exposition Universelle Daum Glassware received a Grand Prize. They continued to show at the Pavilion de Marsan in 1903, in Brussels in 1910, and at the Paris Exposition des Arts Decoratifs in 1925. New techniques and expert craftsmen were primary concerns within the firm. As a result, Antonin Daum set up art laboratories for the training of decorators, designers, engravers, and glassblowers, and also conducted research into new techniques and styles. He had a particular interest in chromatics, notably in powder vitrification, which led to the fine colour juxtapositions and coloured backgrounds in Daum glassware. Daum used known glass techniques in new ways for diverse surface effects, such as using hydrofluoric acid to give a frosted appearance to the glass. 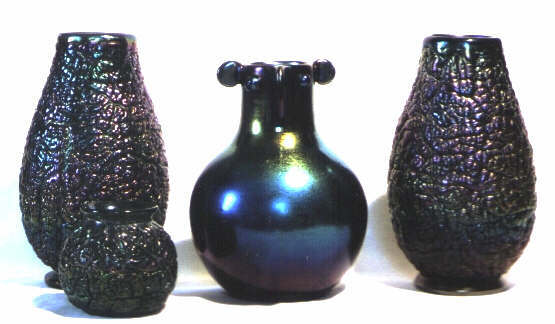 Several patterns were employed so that mould-blown vases could be mass produced more efficiently. To create a cameo effect artisans placed silver or coloured glass over the surface of hot parison (a gather of hot molten glass in its initial globular shape). As the vessel cooled the padded silver became firmly attached to the vessel. The worker then shaped the vessel with either acid or the carving wheel. Another process, known as vitrification, required the worker to place ground, coloured glass on a flat surface and then roll the parison onto the mixture. A rough surface on the vessel resulted from the reheating of the parison until the ground glass fused and vitrified. 'Verre de jade', or jade glass, consisted of a layer of powdered glass with a secondary layer of glass blown over it. The glass layers then fused, resulting in a semi-opaque, clouded look. The glass next received a surface vitrification, and finally the worker etched or carved floral or scenic designs on the vessel. After 1906, the pate de verre workshop opened, adding the glass paste technique to the Daum repertoire. Daum used these known glass techniques in new ways or designed new motifs within the Art Nouveau stylistic vocabulary to make their wares distinct. "A form is decorated, engraved, or carved to various levels; it is then returned to the temperature suitable for the fusion of glass, after which it is cased with new layers of molten glass and fashioned into the definitive shape. Finally, the wheel takes over, revealing, through the reserved foreground relief, motifs imprisoned in the lowest layers, integrating them with the general design, sometimes skimming lightly, sometimes plunging deep into the vaporous mass of vitreous material. This process presents serious difficulties, and for the rare successes the glass blower must be given great credit." These innovations produced new and varied designs, which showed the beauty of the glass as well as the virtuosity of Daum craftsmen. The Daum brothers preferred a purely craft approach to production rather than utilising mechanical means. Though considered the exception, they did mass-produce glasses and tableware using machines, and occasionally turned to the machine for technical experimentation. Another semi-industrial approach Daum took involved the use of moulds instead of pure glass blowing techniques to form the glass vessels. Daum formed glassware by blowing molten gathers of glass into refractory moulds. Unfortunately the mould left marks on the pieces where the hinges of the mould met the vessel. Vases decorated with floral and landscape motifs, in particular, needed elaborate details to hide this "moulded" look. Craftsmen often used a cutting wheel to retouch the vases. This removed the pieces from an entirely mechanical process, and thus somewhat personalised the vessels. Art historian Janine Bloch-Dermant notes: "The Daum brothers understood how to combine two great qualities: creative spirit and technical perfection. This merging of mechanical methods with fine craftsmanship resulted in affordable and superb glasswares. The Daum brothers used techniques and images similar to Galle to elevate glass craftsmanship to a high art. Daum not only used known techniques, but also developed their own set of methods. By merging quality workmanship with a labour saving approach, Daum glassware remained aesthetically and technically advanced amid a huge volume of commercial production. Over the centuries the clarity of the crystal, the unending flow of innovative designs and the superb quality have ensured enduring desirability of Baccarat tableware, decorative items and lighting fixtures And, in fact, the name 'Baccarat' is now recognised and respected by the many who appreciate fine crystal as well as by casual observers of decorative and utilitarian design. Despite wars, social upheavals, economic depressions, border and trade difficulties and stiff competition, Baccarat has managed to hold its own. Although the firm was established as La Compagnie des Cristalleries de Baccarat in 1764 in the French town of Baccarat, debts incurred by poor record keeping, the French Revolution export prohibitions postponed lasting stability and growth until 1816 when Aime-Gabriel d'Artiques, a noted specialist in the crystal industry, assumed leadership of Baccarat. During its early years Baccarat focused on hand-blown crystal. When Francois Eugene de Fontenay, known for his innovative research in the field of crystal, joined the firm in 1840 absolute clarity of crystal was almost impossible to achieve thanks to a, residue left by metal oxide, one of the essential ingredients of crystal. In an amazingly short time Fontenay solved the problem by substituting nickel oxide. In recognition for this improvement, Baccarat was awarded a gold medal at the 1844 Exhibition of French Industrial Products. It is interesting to note that, circa 1816, the well to do of the day gave crystal tableware a prominent new role. Servants had always brought drinking glasses to the table. In response to their admiration for crystal, servants were relieved of the serving duty. Instead a full complement was at hand at each place setting; water glass, one glass for red wine, one glass for white wine and a flute for champagne. The clear crystal, produced by Baccarat, was incorporated into lighting fixtures in 1824 despite ongoing competition from Bohemia and England. Bohemia, then part of Austria and now in western Czechoslovakia, was able to offer lighting fixtures at lower prices. And England had been recognised for its chandeliers as far back as the end of the 18th century. And, indeed, the chandeliers produced by Baccarat suffered a slow start. In a note to the jury of the 1839 Exhibition of French Industrial Products, Pierre-Antoine Godard-Demarest, who would become Baccarat's top executive, expressed the firm's frustrations: "We are showing a collection of crystal for lighting fixtures for the third time. This is obviously not a novelty. Besides, we admit these lighting fixtures are no more meticulous than our 1834 collection which did not leave much to be desired, but it is another attempt to try to convince lighting manufacturers to try to use our crystal ware instead of the Bohemian variety, which is infinitely less refined than our own but favoured because of its low price to which we hope never to stoop... If this latest inducement remains fruitless, we shall have to give up these products all together..." Baccarat did not give up. In the years that followed, the firm won international renown for its chandeliers and other lighting fixtures. They were looked upon then, as they are today, as objects of rare beauty with glittering crystal prisms and faceted lustres and drop lustres that gifted a room with the excitement of sparkling light affected by a near awesome design. Small wonder both noted personages and royalty sought out chandeliers and other lighting fixtures designed and produced by Baccarat. While visiting an Exhibition of Industrial Products, King Louis XVIII praised Baccarat's crystal ware for "its finish and aesthetic qualities as well as for the low prices." Soon after, Baccarat created a stemware pattern for the King. In 1896, Tsar Nicholas the Second of Russia ordered magnificent 3.85-meter high candelabras for his St. Petersburg palace. When the originals were shown at an exhibition they bore 79 wax candles. The candelabra, completed for the Tsar, were electrified. The Tsarina also ordered a candelabra. And, from this time on, Baccarat became a favoured source of crystal ware for the Tsar with orders ranging from lighting fixtures to stemware to which small vodka glasses were added. The Tsar's orders were so numerous they required the full-time use of a furnace that was dubbed "the Russian furnace." Mule teams delivered the completed orders from France to Russia, which was an adventure in its own right. Two Persian Shahs were also sufficiently impressed with Baccarat crystal to place multiple orders that included 2.15-meter high candelabra, many stemware patterns and the fine colour Opaline. Opal glass was the first departure from colourless crystal by Baccarat, although it was neither a major nor lasting product type. Opal glass has a milky white tone with varying degrees of opaqueness and a slightly orange transparency. It was used, for the most part, by Baccarat to recreate china objects-berry dishes, salad bowls, and plates-into crystal. Coloured crystal items, even after colour had begun to rise in popularity, were also a secondary Baccarat product. But, Baccarat was soon to change the role of colour within its crystal offerings. Colour for everything from clothing to china had become the rage during the late 1830s-1840s so called the Romantic Years. Bohemia had already brought colour to the market. And Baccarat understood that "with the creation of an extremely varied palette of colours, competition from Bohemia would be permanently overshadowed." Baccarat, however, was at a disadvantage. While French makers were busied with the production of colourless or Opaline glass and crystal they forgot the secrets of colouring techniques. In the meantime Bohemia had been improving the methods, thus enabling that country to capture the world market with its output of coloured glass. French makers rushed to Bohemia in attempts to learn that country's colour techniques. A series of contests for good imitations were launched by the Society for the Promotion of French Industry in 1836 in an effort to beat the competition. Baccarat attacked the situation on its own. In 1838, managing director Emile Godard-Desmarest and the firm's manager at the time Jean Baptiste Toussaint were dispatched on a secret-decoding trip to Bohemia. The results of the expedition were almost immediate. And Baccarat again took the lead; this time with crystal that was coloured throughout the mass or encased by superimposing two layers of crystal. The variety and richness of the shades developed by Baccarat won yet another gold medal for the firm at the Exhibition of French Industrial Products. The reporter for the Exhibition glass section declared: "Up until now Bohemia... (also) produced coloured goblets in vivid bright rich and varied tones much admired by glass lovers. This exhibition has proved that we no longer have anything to learn from Bohemia." It can be expected that with a broad spectrum of colours in its repertoire Baccarat would be inspired to produce paperweights or "millefiori" the term, meaning a thousand flowers, used by the Venetians to describe a decorative glass made by the early Romans. For millefiori, slender glass rods of different colours were fused together to form glass canes and cut crosswise to create patterns. The cut sections were then placed side-by-side, fused together and blown into the desired shapes. Paperweights were much in demand between 1845 and 1860. In France, three leading crystal works-Baccarat, Saint-Louis and Clichy - responded to the demand. Three paperweight motifs were especially associated with Baccarat the pansy, butterflies seemingly in full flight and snakes on a rocky background. The firm also produced the unusual. In 1848, for example, Jean-Baptiste Toussaint discovered a series of paper cut-outs of roosters, dogs, deer, goats-sketched by his nine-year old nephew. Toussaint was so charmed by the representations he had them reproduced in moulds for use in making paperweights. Baccarat seldom, if ever, lagged in designing and producing new styles and objects to display at prestigious exhibitions and in response to changing tastes that were influenced by the social, political and economic climates. At the 1840 Exhibition of French Industrial Products, for example, Baccarat featured a variety of agate glass items decorated with mythological masks that included Bacchus and heads of fauns. When they were required, handles were completed in varied designs a departure from the previously accepted simple shapes. To complement the huge scale of the 1855 Paris Worlds Fair, dedicated to the power of the steam engine, Baccarat presented its own impressive showpieces. Together with 1,000 other displayed objects, two immense candelabra, each standing over five meters high, held bouquets of 90 candles spread across the diameter of each candelabra. A chandelier, almost five meters high and three meters wide, featuring 140 lights completed what must have been an astounding scene. It is said it was the first time such imposing pieces had ever been produced in France, although the glass fountain produced by the English firm of F. & C. Osler for the Great Exhibition of 1851 may have inspired Baccarat. The Baccarat display at the 1867 World's Fair in Paris might surely have been as dazzling as the Fair itself. A monumental fountain, for example, stood 7.30 meters high and supported two superimposed basins; the diameter of the larger one measuring 3.10 meters. Sad to say, the piece has since disappeared. At this Fair, too, Baccarat highlighted the engraving skills of the firm's J. H. Simon with a pair of clear crystal covered vases cased in ruby -coloured crystal. The 18th century painter and engraver Charles Natoire whose inspiration came from mythology decorated each vase with a central medallion reproducing a painting. The opposite side of each vase featured an engraved theme symbolising the abundance of earthly food with each allegory enhanced by animals living underwater and forest dwellers. A profusion of decorative details completed the lavish design. Smaller objects including enamelled vases and wheel or acid-etched stemware accompanied the imposing vases. Baccarat was the only crystal works to be awarded first prize at the Fair. Baccarat used two techniques for engraving: wheels and acid. Under the skilled direction of the engraver the wheels "bite" a pattern into the crystal that is then coated with a mixture of wax and turpentine. The design is traced on the object with a point and immersed in acid for the length of time needed to obtain the desired depth of the engraving. Although wheel engraving could result in a combination of motifs-say, geometric designs with leaves, flowers and wreaths-it was a costly process. In an attempt to lower costs and increase production Baccarat turned to the acid approach but the firm never eliminated wheel engraving. It was, however, the skill of the engravers on whom the end result largely depended. In an 1863 book the author wrote: "Some (Baccarat) engravers are so skilled that on a rather thick glass they can carve hollow bas-reliefs which, with the light shining through, produce the effect of real sculptures. We have seen a beautiful portrait of Mr. Godard-Demarest's father by Mr. Simon. The same engraver showed us a plaque depicting coloured flowers whose nuances were obtained by etching at different depths into a sheet made of several superimposed layers of coloured crystal." Baccarat greeted what would be a fast-changing 20th century with its own changes. Typically, the Paris showroom was provided with homelike living rooms where the displayed lighting fixtures were at most realistic advantage. New houses for their workforce were constructed close to the factory. The telephone became integral to communicating between the factory and showroom. The automobile replaced the horse-drawn vehicle for deliveries. And new products were developed and sold. There were, for one, perfume bottles. At the start of the century newly industrialised regions created a shortage of employees and Baccarat was hard-pressed to meet the production needs of its already fast-growing perfume bottle manufacture. To solve this problem, a new cutting workshop was built in 1907 located about 10 miles from the firm's factory. Here, local women were recruited to mechanically cut the stoppers and perfume bottles and, so, meet the orders for 4,000 bottles a day; a number that was to continue to increase with the perfumer, Francois Coty, the largest customer. In the years after World War I, Baccarat perfume bottle production continued to rise with much admired designs helping to maintain the firm's star status. In 1925, for example, Baccarat designer Georges Chevalier designed a bottle for perfumer Lubin in the shape of two dolphins joined at their heads and tails. Bottles, designed for Elisabeth Arden, included the now famous hand clasping the perfume bottle, from 1939. And, indeed, Baccarat work has kept pace with the fashions of the eras. In 1937, for example, at the International Exhibition of Arts and Techniques in Paris, Baccarat featured stemware for the table as well as barware, salad bowls, vases and toiletry sets. The emphasis was on the purity and transparency of the crystal and free forms. "From the muslin crystal, so thin as to be a mere suggestion, to crystal structured in its thickness by engraving, the range of pieces ... fit in with the modernity of the exhibition." And, so it has continued. In 1998, Baccarat underscored the contemporary with clear crystal formed into a wide array of objects; tiger, elephant, rabbit, cat and more. Richly coloured paperweights featured fantasy motifs of fish and birds. Barware, bowls, vases and cake plates appeared in streamlined traditional forms and in sleek abstract designs. Authenticating a piece by its mark or signature goes back to 1860 when paperweights were the first to identify Baccarat as the maker. The trademark, printed on a paper circle, included the name "Baccarat" at the top, "France" at the bottom and a decanter flanked by a stemmed glass and decanter in the centre. Unfortunately the label was removed when the object was sold. In 1875, the paper label was replaced by Baccarat's name block lettered in relief on moulded pieces. Bronze mountings also held a signature. It was not until the 20th century that Baccarat crystal included an engraved signature that first appeared on perfume bottles. And, by 1936, with the exception of lighting fixtures, it could be found on all products. In 1971 acid engraved signatures began to be sand blasted. As of 1990 a laser written signature, accompanied by the old decanter, goblet, stemmed glass mark, has gradually been added to all Baccarat products with the exception of jewellery. Collectors, eager to add examples of Baccarat crystal to their collections, have paid over USD3,000 for the always-popular butterfly motif paperweight. And a pair of highly styled horses, one colourless and the other black, dating from the pre-World War II Art Deco years, were purchased recently for USD300. Clichy glassworks originally located in Pont-de-Sevres from 1838 to 1844 and from 1844 at Clichy. Well renowned for paperweights which they commenced making from circa 1845. They also produced art glass in engraved, gilded and etched designs along with coloured tableware items. The original factory at Sevres was bought out by A. Landier in 1885 and renamed Cristallerie de Sevres et Clichy Reunis. Saint-Louis glassworks located in Saint-Louis-les-Bitche in the Moselle region of France, from as early as 1586. Their acclaim to fame is to have been the first glassworks to produce lead crystal in continental Europe in 1781. Like Clichy, St. Louis commenced production of paperweights circa 1845 but followed that with production of malachite, agate and marble glass from 1855. Tableware in cut glass and lead crystal was of the highest quality and standard and sort after by the well to do of the period. Great glass artists such as Goupy, Jean Sala and Dufrene all worked for sometime during their working life for St. Louis. Most pieces prior to 1914 were signed "VS" and their Cameo pieces signed "D'Argental" or "St. Louis Munzthal". From making headlights for motor vehicles to an attractive press-moulded art glass pieces, sums up the glass we now know as Verlys. The Societe Holophane Francais was set up as a subsidiary of the Holophane Company, USA in a glassworks near Rouen in northern France in 1920, initially making headlights for vehicles. By 1925 they had expanded into making art glass vases and bowls and established a department for these products, which they named Verlys. Initially they made blown vessels with several layers of glass, smooth on the outside with internal decoration, however from 1933 onwards they focused on high quality press-moulded glass. They produced clear, frosted, opalescent, and coloured items with designs typical of Lalique-style glass of the 1930's, - plants, flowers, birds, fish, and abstract geometrical patterns. Each year they produced a catalogue with new designs. Their production normally has a moulded signature "Verlys France" or "Verlys Made in France". One might liken their end product as a cheaper version of Lalique, which was more affordable by many, but their pieces have now become as collectable as their famous competitor. In 1935 they established "Verlys of America" with a glassworks in Newark, Ohio. Moulds were supplied from France for the Ohio works, and the same items were made in France and in the USA, although not all the French designs were shared with the American works. Production in both France and the USA declined during the war, as the company focused increasingly on industrial products for the war effort. The Verlys range was progressively abandoned in both countries from 1940 until it ceased altogether around 1951-52. In 1955 some of the Verlys moulds were leased to the Heisey glassworks, which produced a limited range of Verlys designs until 1957, and then returned the moulds. These pieces were not signed. In 1966 the surviving Verlys moulds were sold to Fenton Art Glass Company, who produced some items in distinctly different colours to Verlys, and did not use the Verlys name. For any collector of Verlys glassware as with most other glassmakers there are many pieces made to imitate this French-American glassmaker. More than half a century has passed since the production of this style of glass was at its peak. During the twenties and thirties there had been a large group of artificers of glass, among them Rene Lalique, Sabino, Etling, Hunebelle, D'Avesn, Verlys and Jobling. Of these, two emerged as the most prolific and best- Lalique and Sabino. With the onset of the Second World War, there were great changes in the techniques of glass production. As the costs of hand produced work escalated, this beautiful glass became a rare part of history and the preserve of collectors. Marius Sabino was born in Sicily in 1878, and with his family moved to France while he was still a young boy. His father, a sculptor of wood, trained him to follow in his steps. He would go on to study at L'Ecole Nationale des Arts Decoratifs and the Beaux Arts de Paris, where he became particularly interested in the challenges that the advent of electricity would have on glass manufacture. It was through electric lights that Sabino came to the production of glass. In fact, on his return from the First World War (where he had joined as a volunteer), he founded a factory, which manufactured traditional lights fittings of wood or bronze and then quickly changed to glass. He realised the enormous potential of the new techniques, which made it possible to create the perfect moulds for a unique translucent material. By pouring this material into the moulds, he created beautiful relief in very precise and exciting designs. The glass of the chandelier was no longer part of the design-it was the principal component. His chandeliers, which were often monumental in size, were made to compliment the architecture of the day. In 1925, Sabino created an opalescent glass with a blue hue and iridescent impressions of either clouds in a blue sky, light striking a soap bubble or a reflection from water surface. He designed and made special lighting for luxury liner the Isle De France in 1927 and a lighted fountain column for the Grand Salon of Normandy in 1935. Apart from the chandeliers, he created a multitude of vases and decorative objects, making great use of his expertise as a sculptor. In particular, busts and statues of women, and an exceptionally large range of animals with stylised features-sometimes in extraordinary large sizes. For example, in 1931 he created a large fish in a limited edition, two of which were bought by Josephine Baker and Maurice Chevalier. For his vases and plates he used natural themes, often with animals (particularly aquatic creatures) along with friezes of women and some geometric designs. Using the same motifs, he made many different pieces, which could be used alternatively as paperweights, bookends, plates, and even lampshades when mounted on stand. For Sabino it was possible to create anything in glass! In 1936, he was commissioned to produce all the electric lights fittings and chandeliers for the shah of Persia. During these years, he also exhibited at all the major Salons. For the 1937 Exposition Universelle, he designed an illuminated column. A Maharaja had even asked him to make a throne of glass, but the outbreak of World War 11 prevented the completion of that commission. Sabino recommended production in 1941 but did not design any new pieces. Sabino Glass was and still is, made in France to the designs of Marius Ernest Sabino. Sabino himself was born in Sicily in 1878 but went to France at the age of four. He followed his father's footsteps in training originally as a sculptor, and that early training can be detected in the exquisite figurines that he sculpted to make the moulds for his glass designs. Sabino fought for the French in the First World War, and after the war he recognised the commercial opportunities for glass products in the newly emerging electric-lighting industry. The company he set up made lighting products (lampshades, lamps, glass panels, etc.) and a range of opalescent glass vases and statuettes. They had retail outlets in Paris as well as their production facilities. They won prizes at all the major international exhibitions between the two world wars. Originally Sabino glass was either marked "Sabino France" because it was intended for export, or "Sabino Paris" if it was intended for sale within France. Post-war production has all been made in France and then exported to the USA. The larger pieces still carry the "Sabino Paris" signature, which was etched onto the base of the pieces. 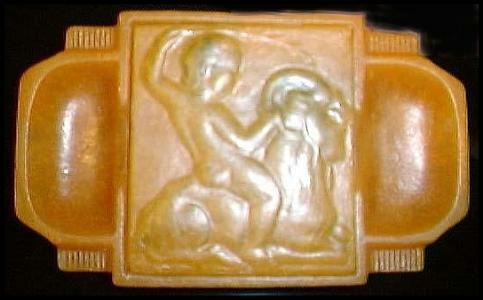 Smaller pieces are marked "Sabino France" moulded into the side of the item. The Sabino Company still sells early stock of some items, which can no longer be made because the moulds were destroyed. Verart and "Vernox" were two other trademarks used by Sabino during the 1930's. They were developed to compete in the cheaper market for opalescent glass that had been opened up by companies like Holophane (trademark "Verlys"). Eugene Rousseau was a notable French designer and decorator of glass and ceramics. He was one of the first designers to fall under the influence of the Japanese arts. He was known for his making of imitations of jade in glass. His most interesting works being large and rather heavy glass vases ornamented with crackling and splashes of colour. In 1865 he handed over his studio to his pupil Ernest Baptiste Leveille who worked more in sculpturesque but otherwise similar in style. Gabriel Argy-Rousseau's virtuosity in a glass making technique called pate de verre or "glass paste," brought him instant acclaim upon his first showing it in 1914. He neither invented the technology for pate de verre nor manufactured it in large quantities for the first time. However, he exemplifies the successful small producer who remained true to the principles of small scale production and hand workmanship over industrial practices. Unlike Lalique and other late decorative artists, Argy-Rousseau never resorted to mass-produced glass. 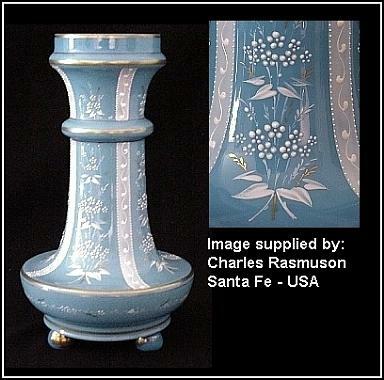 He did succeeded in making "high art" glassware in the natural forms and soft colours of Art Nouveau, and gained a reputation for superb work in the medium. The latter half of the nineteenth century brought the revival of this ancient technique. Though the operations proved both complicated and delicate, Argy-Rousseau manufactured everything within his own workshops. Like Louis C. Tiffany, William Morris, and Emile Galle, master craftsman Argy-Rousseau improved his methods through continual experimentation. He also made his wares affordable to the public at large through mass production. During a time when decorative artists worked in various mediums or at least in many techniques within one medium, Argy-Rousseau limited himself to pate de verre, which consists of powdered glass moulded and then fused by heat. Argy-Rousseau completed his degree at the National High School for Ceramics in Sevres, France. As art historian Janine Bloch-Dermant notes: "Technique was of paramount importance to Argy-Rousseau and as soon as he had left school, he chose the title 'engineer-ceramist'. At the school Argy-Rousseau became friends with Jean, the son of Henry Cros. Henry Cros, the man responsible for the rediscovery of the technique of pate de verre, ran a workshop in Sevres in which the young Argy-Rousseau learned the art of pate de verre. In 1914, Argy-Rousseau first exhibited his designs in pate de verre to immediate success at the Exposition du Salon des Artistes Francais. The critics responded enthusiastically, "Such successful shapes, such amazing colouring produced by the gold, brass, cobalt, and uranium oxides; such beautiful intermingling of colours, such fluid sculpture! However, Argy-Rousseau did not make his work widely available to the general public until 1921. When Gustave Moser-Millot, the owner of both a Parisian gallery and a glassworks at Karlovy-Vary in Bohemia met with Argy-Rousseau, they formed Societe Anonyme des Pate de verre d' Argy-Rousseau. A third member, Moser-Millot, acted as chairman of the board of directors and Argy-Rousseau became managing director. It was decided that the company would encompass, the industry, the manufacture, the commerce and everything those processes entail of the product known as 'Pate de verre d' Argy-Rousseau' and all the other products associated with pate de verre, enamelling on glass and all other items produced by firing. During the first year, the fledgling company ran at a loss due to the costs of technical updating, the transformation of the company into an industrial and commercial venture, research, experimentation, new furnaces and muffles, and the training of twenty workers and decorators. However, Argy-Rousseau soon began producing vases, bowls, night lights, lamps and shades. Argy-Rousseau promoted both the glass technique and the actual wares. He advertised his Les pates de verre of Argy-Rousseau in both French and American decorative arts magazines of the time. The advertisements also served to give Argy-Rousseau credit for the new techniques he invented to improve the method of making pate de verre. He educated his purchasing public with leaflets, which described the procedure for producing pate de verre in sufficiently explicit detail to cultivate appreciation of its finer qualities. The focus of Argy-Rousseau's experimentation was different methods of achieving pate de verre effects. He used a model and mould method technique for most glass production. A mixture of plaster and other materials was placed upon a model to form a mould. This mould, after drying, was then filled with the ground glass. The mould was not reusable, but the original model could be used an infinite number of times. Argy-Rousseau made glass in both coloured and colourless versions to produce the exact colours he desired. Argy-Rousseau hoped to create and produce for a mass market and not just for the elite. Unfortunately, he never realised this goal because the technique of pate de verre did not allow one to turn out quantities of similar items on a production line. Furthermore, there were significant losses incurred during production and firing. In the end, however, Argy-Rousseau did develop certain labour-saving semi-industrial techniques. For example, he used moulds which enabled the same model to be produced a number of times. Still, he had to mix the actual glass paste with its colour-producing oxides separately for each item. Despite the fact that he utilised the same model each time differences in thickness and height resulted. Further, each piece gave the illusion of uniqueness because minimal variations in mixing or firing could produce a wide variety of colours. Within the production stages of pate de verre glassware each component required individual hand work. Machines could not be utilised. Technicians repeated tasks in production line manner by hand, preparing the pate, placing the items in the furnace, and firing. Argy-Rousseau assumed the role master craftsman; he devoted his energies to every step of the production process and acted as both technical and artistic director. He did not employ teams of artisans and scientists, like Tiffany or Galle, but personally took charge of all the firm's projects. However, as was then fashionable, Argy-Rousseau presented himself as an industrialist. La Nature, a contemporary journal, reported in 1928, "He obtained strong relief industrially... and after experimenting with new coloured pastes, and having placed a test tube in a small muffle furnace... these preliminaries completed, the industrial production began. Argy-Rousseau self-presentation as an industrialist was consistent with the era's pride in its technical progress. The public at large appreciated the industrial, as well as the artistic, nature of his work. Like other industrial producers of glass such as Rene Lalique and Emile Galle, Gabriel Argy-Rousseau considered himself an industrialist as well as an artist. However, it will be shown that Lalique's large-scale production of glassware using indestructible cast-iron moulds differed from Argy-Rousseau's small scale methods. Galle's workshop methods also differ because Argy-Rousseau followed the production procedure from beginning to end, resulting in each piece being a 'unique' work of art. Finally, the true nature of Argy-Rousseau's pate de verre leads it to be deemed industrial only in the sense that it encompassed the transformation of raw materials into finished products. Argy-Rousseau, truly a craftsman working in an industrial context, produced pate de verre for a new generation of buyers eager for his finely crafted glassware. His embrace of quality designs in the flora and fauna motifs of Art Nouveau, along with expert workmanship, popularised his wares with an elite public. Like William Morris, Argy-Rousseau necessarily catered to the upper classes, the only consumers who could afford his wares. Unlike Morris, Argy-Rousseau desired more industrial methods, but his medium stipulated hand craftsmanship. Thus he never mass produced pate de verre in such a way as to make it widely available, nor did he consider his artistic wares truly industrial. Leveille was a glass artist who worked for Eugene Rousseau from 1885 becoming manager of the glassworks in 1888. In 1901 he formed 'Toy and Leveille' but in 1906 he sold out to Heraut et Guigand. Maurice Marinot studied at the Ecole des Beaux Arts in Paris and participated in the Salon d'Automne there as a Fauvist painter in 1905. In 1911 he began decorating glass blanks with enamels at Troyes and in 1919 started blowing his own pieces. His works are ornamental rather than practical and consist mainly of bowls and flasks, modelled with a feeling for solid sculptural form, either clear of coloured, sometime enamelled but more often, and more satisfactorily, etched with freely drawn figures. He also had a technique for sandwiching a core of coloured glass between two transparent layers. He made much decorative use of such imperfections as air bubbles and crackling. With simple tools he bent and manipulated the glass but, to a certain extent, allowed the nature of the material to determine its own form. This spontaneity represented a dramatic departure from the technical precision of earlier glassmakers, just as his massive, chunk like works departed from the traditional values of delicacy, fragility and perfection. As Marinot's technical facility grew, his works became increasingly abstract and innovative. Although they shocked the refined tastes of glass connoisseurs, his rough-hewn pieces, with their random globules and irregular shapes contributed significantly to the development of glass as a medium for modern art. In 1937 he ceased glassmaking due to ill health and returned to his initial love of painting. Navarre was a glass artist from Paris working in sculptured, thick walled pieces, during the period 1924 to 1960 and most pieces are signed and have become very collectable. Legras & Cie was a glasshouse which came about when Auguste Legras purchased the 'Verreries et Cristalleries de St. Denis' in 1864 'Cristallerie Vidi' and 'Verrerie Mellerio' both in 1897. The glasshouse made cameo glass embellished with enamelling. It used the marks 'Legras' and 'Mont Joye & Cie'. After World War I it merged with the Pantin glassworks, and operated as 'Verreries et Cristalleries de St. Dennis et Pantin Reunies', using the marks 'Pantin' and also 'De Vez' the pseudonym of its Art Director, De Varreux. The glasshouse was taken over by Souchon-Neuvesel in 1924. Schneider Cristallerie was a glasshouse founded at Epinay-sur-Seine in 1908 by Charles Schneider [1881 - 1962] and his brother Ernest. 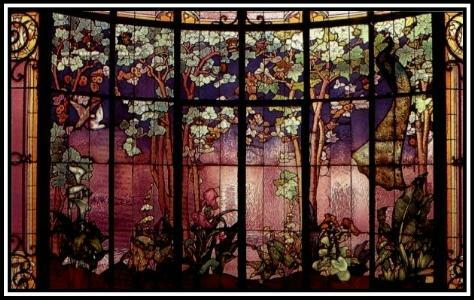 Charles had studied the art of glass decoration under Emile Galle and Daum at Nancy. The original commercial production was changed in the 1920's to decorative glassware of the Art Nouveau style, featuring cased glass of two or three colours, sometime decorated by means of hydrofluoric acid. Pieces signed 'Schneider'. 'Le Verre Francaise' or with filigree design, the rarest pieces being signed 'Charder'. The artistic direction passed in 1948 to Robert Schneider, son of Charles and in 1962 the factory was moved to Lorris. Andre Hunebelle was born in Paris in 1896. He studied mathematics at the Ecole Polytechnique in Paris, but these studies were interrupted by his involvement in the First World War. After the war, Hunebelle began designing pressed glass inspired by the work of Rene Lalique. In 1927 Hunebelle exhibited his first collection of glass, which rapidly became fashionable and brought him popular acclaim. Although similar to Lalique's glass in many respects, Hunebelle's work maintained a unique identity and style. He was influenced greatly by his love of mathematics and the prevailing fashion for what we now call Art Deco. The decoration of his designs was often very stylised or abstract and frequently used contrasting planes of glossy and frosted glass, a process also utilised by Rene Lalique. Andre Hunebelle created a range of vases, bowls, plates, ornaments and lamps and opened a luxury shop in Paris. Etienne Franckhauser who also made moulds for both Lalique and Sabino made many of the moulds for Hunebelle's glass. Much of his work, particularly in the earlier years, was in colourless glass, although he increasingly used coloured glass for his designs and is possibly known for his opalescent glass, although his competitors such as Lalique and Sabino are more widely known. He invented a style of port decanter, which became very popular and was copied in several countries, with the handle at the top and pouring spout at a 45 degree angle on the side, very much in the style of the Arts and Crafts maestro, Christopher Dresser. Hunebelle pieces were marked in several ways. The most common was "A. HUNEBELLE-FRANCE" in moulded capitals either within the glass design or on the base. Other pieces are marked simply " A. HUNEBELLE". A paper label with an A and H superimposed was also used in some instances, and since these labels were often lost, especially when the lady of the house washed the item, these pieces may appear completely unmarked. Hunebelle also used a more elaborate maker's mark imprinted on some glass pieces which had the word "FRANCE" encircled by the words "MADE IN FRANCE MOSELLE DEP et R COGNEVILLE" and with "A. HUNEBELLE" underneath. Hunebelle finally abandoned his glassmaking career for work as a newspaper administrator and his shop in Paris closed in 1938. After the Second World War he became a successful film producer and director, making many films and winning the Prix du Meill twice. Andre Hunebelle died in 1985. Father Jean-Pierre and son Samuel live and work in Saint-Paul-de-Vence, the celebrated village from the Middle Ages where the light inspired Picasso and serenity attracted the likes of Yves Montand and Jacques Prevert. The Cinquilli's workshop, a converted old sheepfold, sits at the end of town. There, both father and son create exquisite artistic glass creations employing the same techniques and tools traditional glassblowers have used for centuries. Their creativity and talent have prompted commissions from numerous collectors throughout Europe, the Middle East and North America who know and appreciate their work. Several unique designs can also be appreciated in prestigious hotels such as the Colombe d'Or, the Saint Paul and the Diamant Rose. Having mastered the mysterious relationship between the rod and molten glass, the elder Cinquilli, a master glass artist since 1963, creates these featured pieces by uniting two colours - white and orange - in an intriguing web of colour and design. The natural oxidation of acidic vapours creates their iridescent sheen. The inherent beauty of each piece is made even more magnificent when displayed directly under light. There are many names associated with the glass making industry of France and although the details are not very comprehensive, the following all had an important part to play. Born in 1870 he was a pupil of Jules Larcher at the municipal school of fine arts of Nancy and precocious collaborator of the Daums, he followed Jacques Gruber in this glasshouse to orient the decoration of glassware. The indications "drawings artistic decorative" and painting carried on his business card indicates the main axes of an activity essentially given to the graphic arts. Little of his decorative painting however has survived. One of his most famous watercolours of slipper-form orchids captures the subtle beauty of the plant. Clotilde Bacri once described it in the following words; 'Each flower has its own chromatic identity. Nature is glorified with festoons of leaves that recount eternal springs, prolonging the reveries of Carpeaux, while reddish branches announce the change of seasons. In refined colourings wisteria, honeysuckle and morning glories unfurl stems and flowers in aerial undulations. Petals have all the brilliance of butterfly wings and butterflies take on the fragile beauty of open corollas'. On the other hand, the museum of the school of Nancy possesses a stained glass window signed by him, and he is also the author of the stained glass windows of the Small Trianon in Malzaville close to Nancy. Professor of drawing before 1914, at the Loritz School, which dispenses and offers a professional teaching to students. It was at the Daum glass factory that he knew Amalric Walter to whom he provided a number of models for the styles of glass made by the great artisan. Born in Sundhausen in 1870 and moved to Nancy in 1871, to study at the high school and at the municipal school of fine arts, then in Paris from 1889 at the school of the decorative arts and fine arts. Back in Nancy in 1893 he take his turn to teach in the school of fine arts and in 1897 he became a creator for Daum of vase decoration. In fact, he was interested in the various decorative art techniques, the one of wood, of leather, providing models executed by craftsmen such as the sculptor Justin Ferrez, 1870 - 1920, before that to dedicate exclusively to the stained glass window shortly after 1900. Without breaking with Nancy, he settled in Paris in 1920 and continued his interests of the art deco style, the period even proves to be particularly fertile. His activity of painter - glassmaker between the years 1900 and 1914 was considerable, his frequent high quality, a manner very affirmed, make it especially representative of the successes of the movement Nanceien in this area. Gruber died in Paris in 1936. Paul Nicolas was born in 1875 and he learnt his art under the direction of Emile Galle, at the school of fine arts, the pose of the enamel on glass, the one of varnish for the engraving to acid, and also wheel engraving. Familiarised since the childhood with nature and the wild plants and habitats, he becomes drawn under the direction of Louis Hestaux. He was instrumental in the conception and the execution of the products delivered by the factory after the death of Galle. He established his own business in September 1919, whilst collaborating with Saint - Louis who provided him the "blanks", for his own production, most of his pieces were signed but many have been rubbed off over the years. Amalric Walter was born in Sevres and went to Nancy February 1st, 1905. He worked for the Daum factory from that date for many years. According to his own indications in the catalogue of the Lounge of Nancy in 1920, he had been a pupil in the Factory of Sevres. His achievements include a Diploma of honour to the world fair of 1900, diploma and medal of gold to the Exhibitions of Nancy in 1909, of Brussels in 1910. He had worked for Daum Freres at Nancy from 1908 to 1914, where he had experimented with bowls and vases in coloured abstract patterns. It is in collaboration with Henri Berge that he started his personal production. Walter was a pioneer in Pate-de-Verre and pieces made by him command very high prices, such as face masks for dolls. Other items made by Walter in Pate-de-Verre included sculptured three-dimensional figures of lizards, crabs, frogs and fish, and also female forms. These were sometimes placed on the rim of a bowl. He also made copies of 18th century figures and Tanagra-style figures. For those of you not familiar with Tanagra-style figures these are replicas or adaptations of terracotta Tanagra figures usually made of Pate-de-Verre. It was mostly the French glassmaker who produced such items, including Argy-Rousseau and George Despret as well as Walter. The original figures, made of terracotta, were moulded in several centres in Greece and at colonies in Italy and Asia Minor, the examples of highest quality being those discovered in 1874 in the Tanagra district of Boeotia. These date from the latter part of the 4th century BC onwards, and represent men and women, and gods and goddesses usually in costumes of the period. Some pieces are signed by him and also bear the name of his collaborating designer Henri Berge. Despret was a French glassmaker, although a Belgian by birth, at Jeumont and who specialised in making vases of overlay glass with entrapped air bubbles and abstract patterns in various colours, but from 1890 he specialised in making objects in Pate-de-Verre. Like Walter he produced mainly female figures in the Tanagra-style and some examples of fish can also be found in rare instances. He signed pieces with his engraved signature 'Despret'. During World War I his factory was destroyed, but it was reopened in 1920 but finally closed in 1937. I have used the wording "Pate-de-Verre" in this article and believe it helpful to give a short description of the term. Pate-de-Verre literally means glass paste, which is achieved by grinding glass to a powder, adding a fluxing medium so that it would melt readily, and then colouring it or by using coloured powdered glass. Objects were made of it in a mould and firing fused the material. The varied colouring, suggested by semi-precious stones, was obtained by the positioning of different powdered ingredients in the mould. Some examples were built up into polychrome high relief or busts by successive layers in the mould, and sometimes, after the firing, they were refined by being carved. The process was known in ancient Egypt and was revived in France in the 19th century, especially by Henri Cros and his son Jean. Other exponents of the technique other than those mentioned in the article include Albert Louis Dammouse and Francois-Emile Decorchemont. Pate-de-Verre is sometimes called Pate-de-Riz. French Glass has played a major part within the glassmaking world and continues to do so with such companies as Daum, Baccarat and Saint Louis still producing fine items for the connoisseur. It is a testament to those who led the field in glassmaking that styles and traditions of their forefathers continue as we go forth into the 21st century. I sincerely hope that this major article on those who played a major part in the glassmaking industry of France may have broadened your knowledge and that you continue to enjoy your collecting passion of glass. It has given me great pleasure in writing this article and to learn more about a glassmaking country, which for many years was a front-runner in the world of design and style, and my sincere thanks go to all those who have helped me to learn more about French Glass, its makers, its styles and its tradition. THANK YOU. The Legacy of Samuel Clarke. Whenever anyone talks of Glass Fairy Lights, they are continuing the legacy left to us by Samuel Clarke, who introduced the world to this extremely collectable glass item. It is the name of Samuel Clarke, which will always be associated with decorative Fairy lamps. Coloured glass night lights or Fairy lights were very popular during the second half of the 19th century and it was during the 1880's many fancy decorative pieces were made in England and throughout glasshouses in Europe. Over recent years these lights have become a very collectable item and some of the very decorative ones now command very high prices. Initially the night-lights were very simple and it was only with further development in decoration that made them a desirable item for the collector of glassware. In 1886, Samuel Clarke introduced his decorative Fairy lamps and they were no longer just confined to use in the bedroom or nursery, but to dining and drawing rooms, enhancing an enchanted lighting display. During dinner parties of the Victorian era, they were used as part of a table decoration and reported so at the time. The new Fairy lights which are well named, for their effect is quite fairy-like. Small lights, which are placed in the centre of a circular flower vase, each being covered with a glass shade in varying colours. The circular flower vase being filled with ferns, moss and one or two flower heads and the softness of the light gave an added beauty and the overall effect was extremely becoming to the diners. Clarke was the first to acknowledge that advertising paid and throughout the last twenty years of the last century, he placed adverts for his Fairy lamps in various publications. One interesting reference found in 1886 was in the 21st April edition of The World, which described the types of Fairy lamps then in production. "These are now new developments in the modes of using the Fairy lights which will be sure to make them very popular this season. Chandeliers from five to eighty lights, in all kinds of pretty glass, are now made, and with these and wall brackets it is possible to illuminate a large dining room most effectively. The dome shaped glasses come in many pleasing effect, stained glass, cameo, striped and in every colour possible. Cut glass domes will shortly be available extending the amount of light emitted." From the earliest of Victorian days, the name Clarke was associated with night-lights. George Miller Clarke, in 1844 took out a patent for an improvement in night-lights, and Samuel Clarke in 1857 took out a patent relating to the form of illumination. Samuel Clarke first profession was one of high quality candle and taper manufacturer, and he himself did not make the glass or ceramic holders and shades, which are now so very collectable. Samuel Clarke spent vast sums of money in advertising his different types of candlelights, and during the 1880's he enjoyed widespread free publicity in most of the popular magazines of the day. One can consider Sam Clarke as a Victorian entrepreneur, in advertising as is shown by him supplying free of charge many thousands of Fairy lamps to the Royal Botanical Society to be used at their summer fetes. In 1887 over 20,000 of Clarke's lamps were hung in trees, arranged in flower beds or used to illuminate the covered walkways in the Society grounds. The lamps were not just confined to the outside. Indoors they were used in conjunction with specially designed candlesticks and ornamental candelabra in glass, brass, silver plate and porcelain. Many of the finest porcelain bases being made by the Royal Worcester Company. Various trade names will be found on Fairy lamps. In January 1887, Clarke used the name Pyramid, which were smaller than the original Fairy lamp and the name Fairy-Pyramid was registered. In October of the same year the Wee-Fairy was registered, again this was even smaller. Clarke's Fairy trademarks occurs moulded in the base of the candle container and not normally on the ornamental base. Many of the earlier examples show the fairy's left hand is close to her head. After 1895 many specimens made show the name Cricklight which was derived from Cricklewood the district in London where the Clarke family lived at that time. With many other manufacturers trying to emulate Clarke's success, other trade names were used. J. Walsh, Walsh of Birmingham, used 'Glow-worm' from 1887. "Will o'the Wisp" was the name given to lights made by Edward Webb of the White House Glassworks, Wordsley, near Birmingham in several styles and in twelve charming colours. 'Bijou' again another name used by the maker, J Stembridge & Company of London. It was not only in England and America where the night-light was produced, but many Continental glassmakers produced many fine examples. By this time Samuel Clarke's ware were patented in France, Belgium, Austria, Spain, Germany, Russia, Australia and the USA. As demand was brisk, manufacturers had to introduce new colours at frequent intervals and some of the colour names used were; Citron satin, Amber tinted satin, Naire de Perle, Rose Cleveland and Ruby treaded opal. The term Cleveland was used to describe different coloured vertical bands, which were sometimes twisted so that spirals were formed. Some domes are plain with others being ribbed or having other decorative features such as enamelling or gilding. In 1910 Messrs. Price's Patent Candle Company Limited, an old established firm of international repute, who in 1849 employed 700 people, purchased the Clarke concern, but for many years the new management retained and used Clarke's name and trade marks on night-light holders. Overall we see during the reign of Samuel Clarke, his expertise not only in advertising but also to produce the night-lights in may colours and styles, many being emulated by the famous of glassmakers, none more so than the Queens Burmese produced by Thomas Webb & Sons. 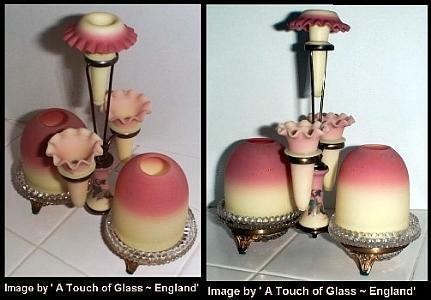 The art of making Fairy Lights continues to this day with Fenton Art-glass of America, possibly being the best known. During the years since the conception of the Fairy Light many makers throughout the world have contributed to ensure the artistry has not died. So it is clear to see, no matter who the manufacturer was, Samuel Clarke left the collectors an item now very much treasured and desired. One could liken his strategy to the saying; from a small acorn grew a massive oak tree. The legacy of Samuel Clarke is recorded for all to see in the examples of craftsmanship still with collectors as we enter the new millennium. Full details can be found in the article above on French Glass.